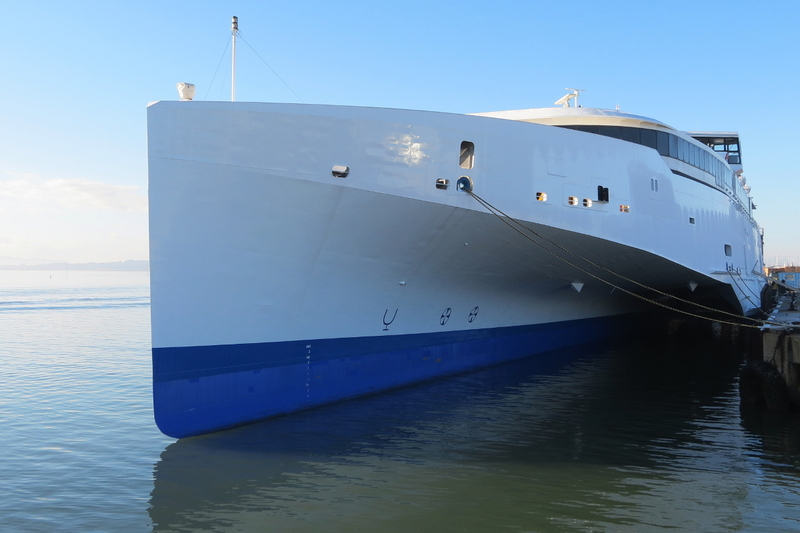 On the 19th March we were invited by Condor Ferries to join them for a shakedown cruise on their new vessel the Condor Liberation from Poole. The purpose of the trial was to test the ship in a ‘in service’ condition, with all the ships facilities open for the passengers to enjoy and to give the companies shore side and deck staff the opportunity to load the vessel with different combinations of vehicular traffic. 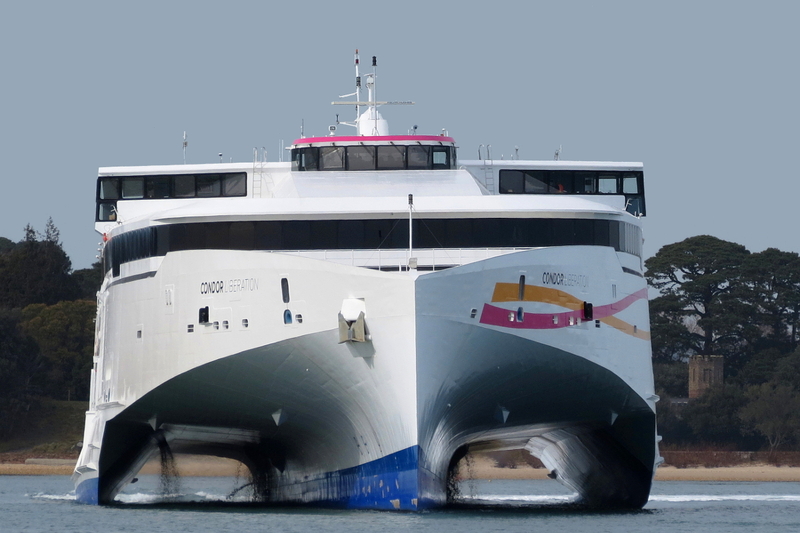 Paul Cloke and I have both had previous experience of travelling with Condor Ferries from St Malo to Jersey on the Condor Rapide in October 2014 so it would be interesting to compare the new ship and her facilities with those found on the Condor Rapide. With this article we aim to show how the vessel was prepared for service from delivery to her maiden voyage and we would like to share with you what the craft is actually like on board. Please note that our experience of the vessel was carried out during a test/trial of the vessel and some areas of the ship may have changed since our visit. As always in our small online maritime community we are very grateful for the support of our site contributors who have supplied photography and video. I would like to take this opportunity of thanking the management and staff of Condor Ferries, Paul Cloke, Kevin Mitchell (Maritime Images), Dan Hall, Chris Gosling (Shipping TV) and Robin Fitzgerald (Jersey Coastguard) for their assistance in producing this feature. 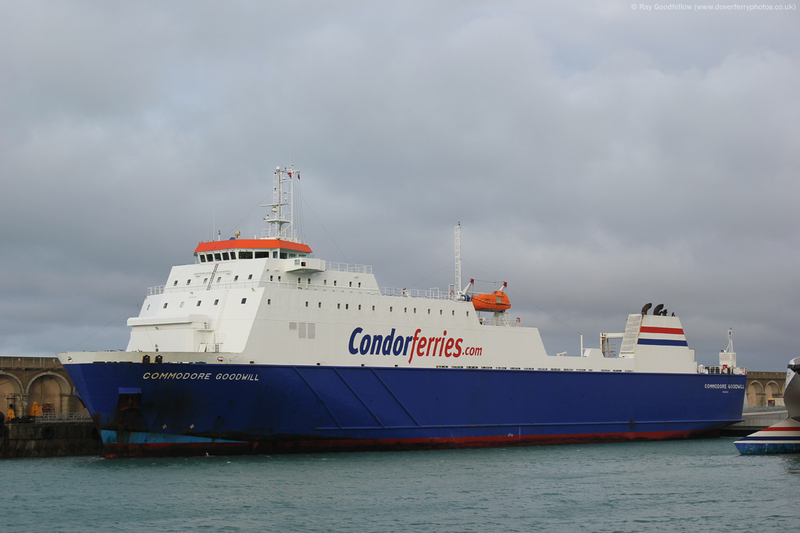 Condor Ferries was founded in 1964 and initially operated a passenger only service between France and the Channel Islands. 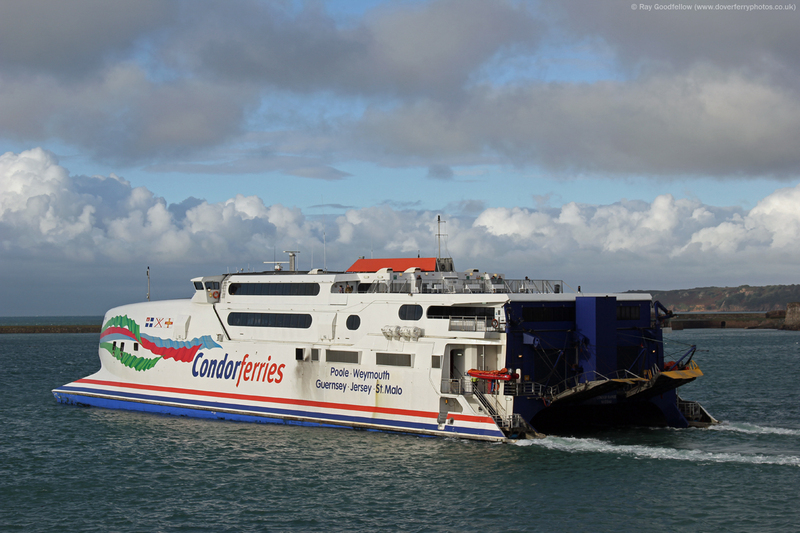 In 1987 the first service linking the Channel Islands with the UK was launched. Until recently Condor Ferries operated a year-round service connecting the UK to the Channel Islands through Poole and Weymouth. 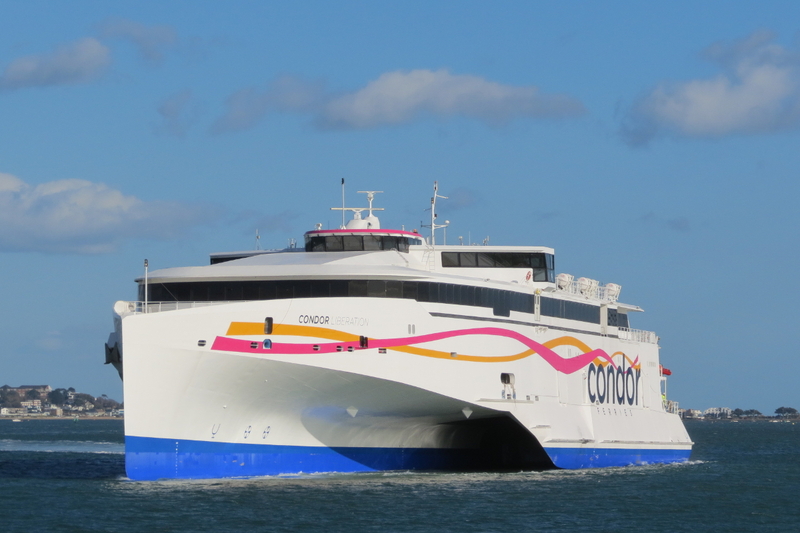 Following the acquisition of the Condor Liberation Condor Ferries announced that they would no longer operate from Weymouth and would concentrate all their high-speed services to the Channel Islands from Poole. 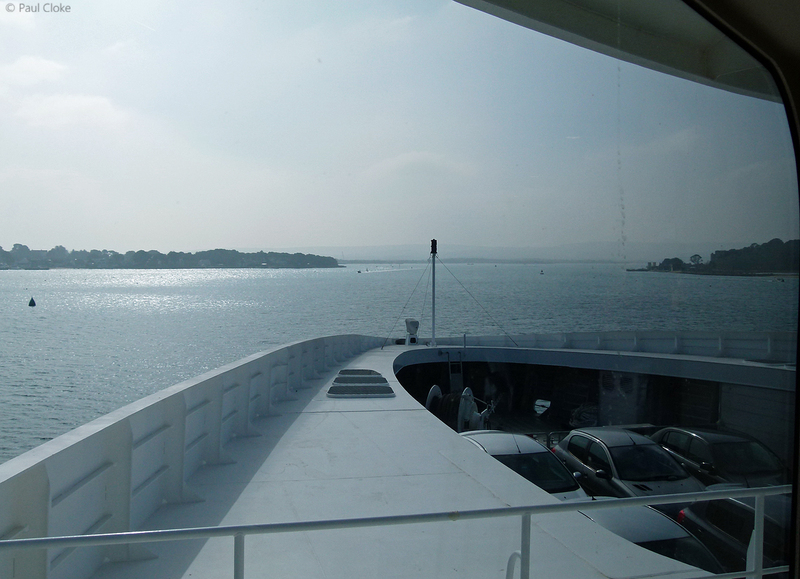 This announcement brought about the end of commercial ferry activities at the Port of Weymouth and thus ended a 190 year old link with the Channel Islands. 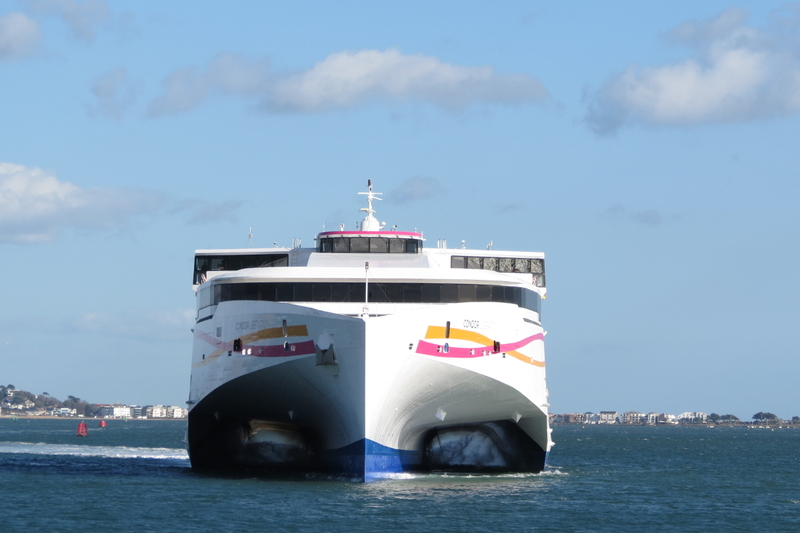 As well as the high-speed crossings from Poole Condor Ferries also operate two conventional ferries from Portsmouth to the Channel Islands. These are the Commodore Clipper and the Commodore Goodwill. 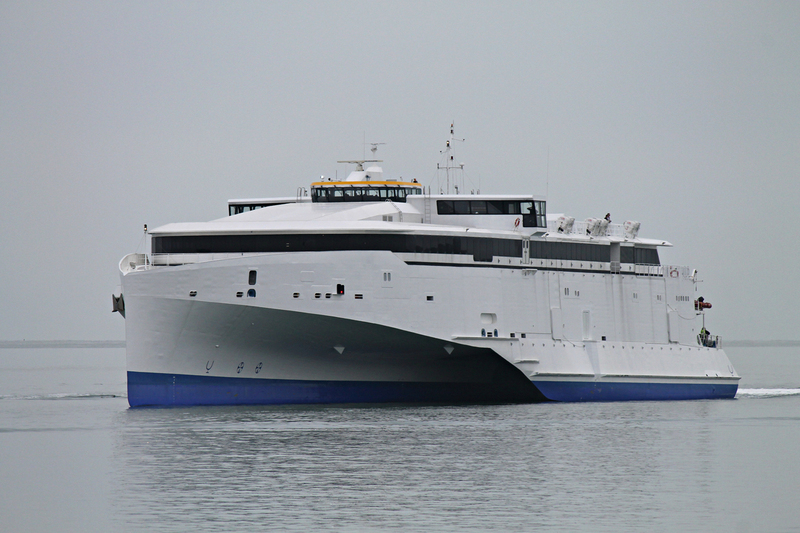 The Commodore Clipper is a conventional car, passenger and freight carrying vessel which has capacity for 500 passengers whereas the Commodore Goodwill is a freight only vessel capable of carrying 12 passengers. 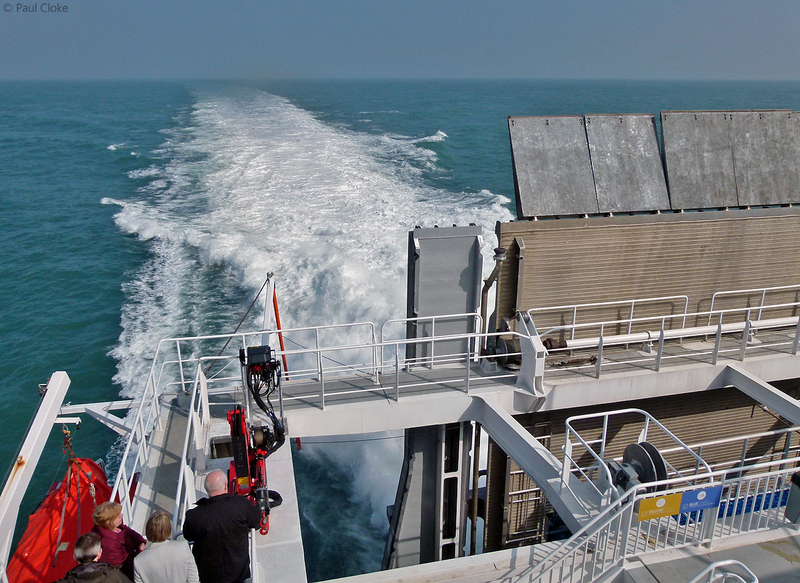 The conventional ferries carry on average 100,000 freight vehicles to/from the Channel Islands each year. 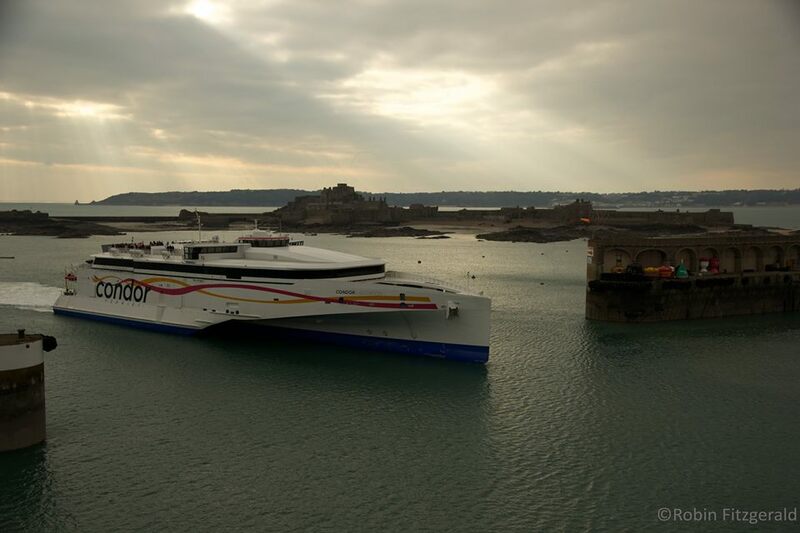 In addition to the ferry activities at Poole and Portsmouth the company also operate a fast ferry service from Guernsey and Jersey to the port of St Malo in Brittany, France, this service is operated by the 86 metre Incat built Condor Rapide (045). 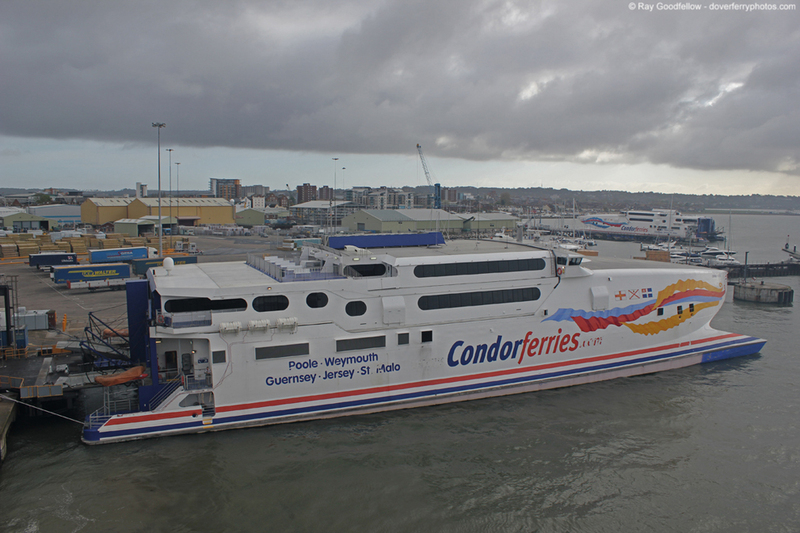 The use of car carrying high-speed ferries between the UK and the Channel Islands commenced in 1993 when the 74 metre Incat Condor 10 (030) entered service between Weymouth, Jersey and Guernsey. She was replaced by the 78 metre Incat Condor 11 (034) in 1994. 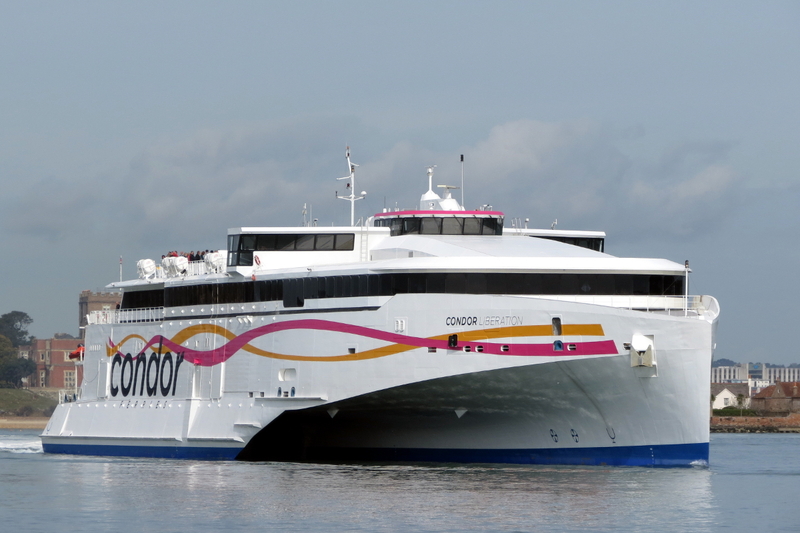 The Condor 11 was replaced by the 81 metre Incat Condor 12 (038) in 1996 and she was superseded by the 86 metre Incat Condor Express (042) in 1997. 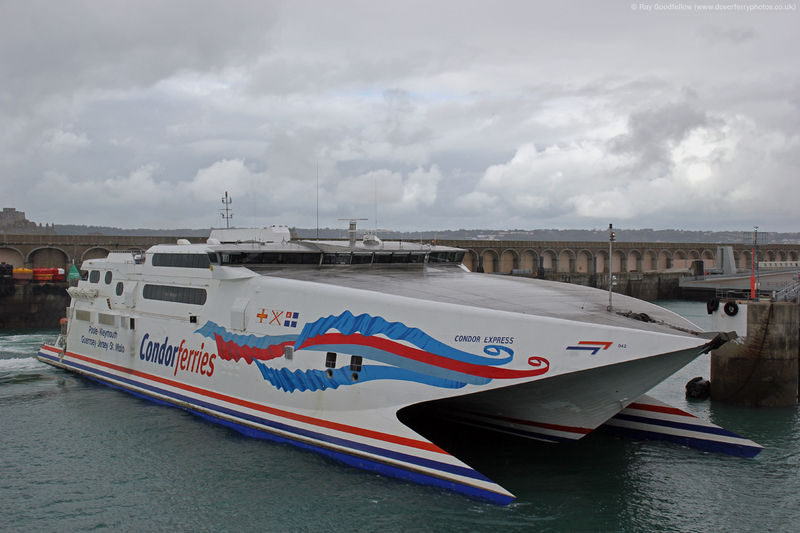 In 1998 the 86 metre Incat Condor Vitesse joined the fleet. 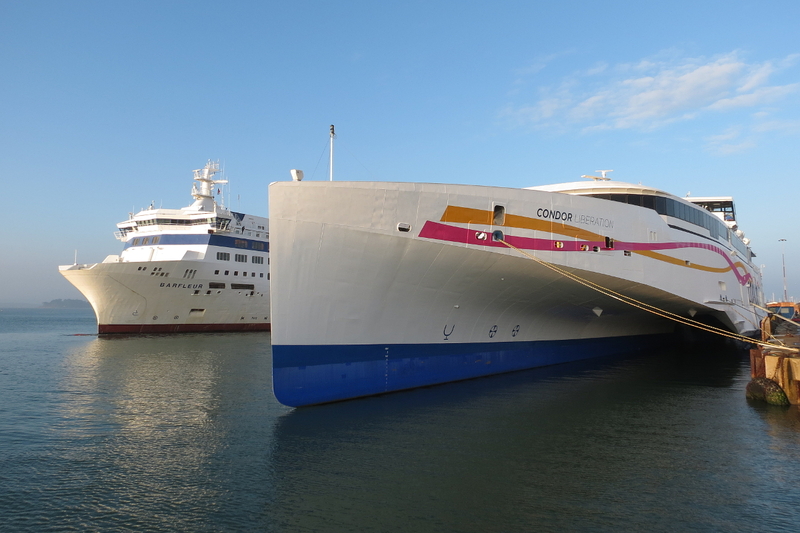 The introduction into service of the Condor Liberation has seen the withdrawal and sale of the Condor Express and Condor Vitesse to the Greek domestic ferry operator SeaJets for further service in the Mediterranean. 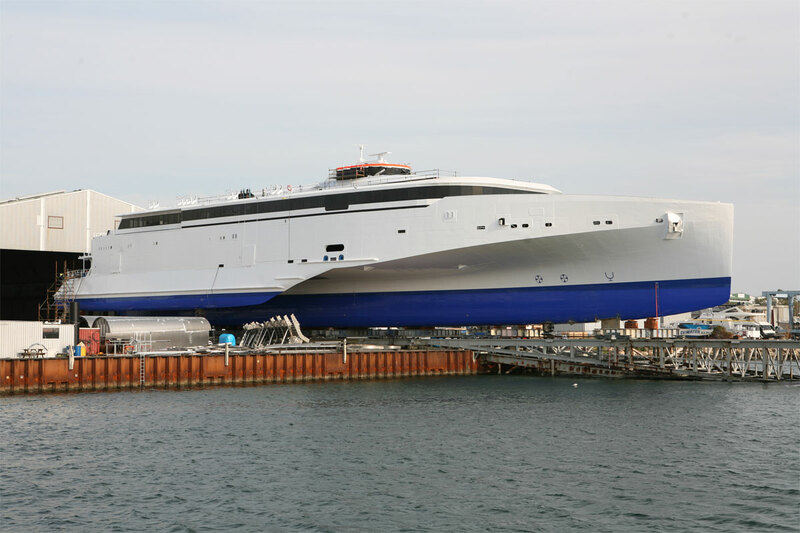 The Condor Liberation is an aluminum ‘Auto Express‘ 102 metre trimaran (stabilised monohull) Ro/Ro car and passenger ferry built-in 2010 by Austal Ships, Fremantle, Australia (Yard No 270). She was built for Austal Ships PTY Ltd, as a ‘stock’ vessel for the international sale and charter market. She was launched on the 9th December 2009 and was completed in 2010. 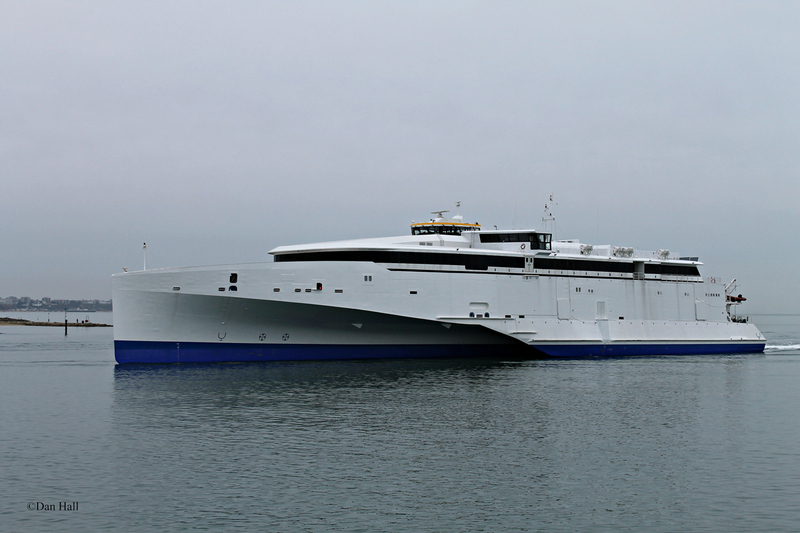 The 102-metre trimaran is an evolution of Austal’s trimaran ferry Benchijigua Express which currently operates in the Canary Islands for Lineas Fred Olsen. 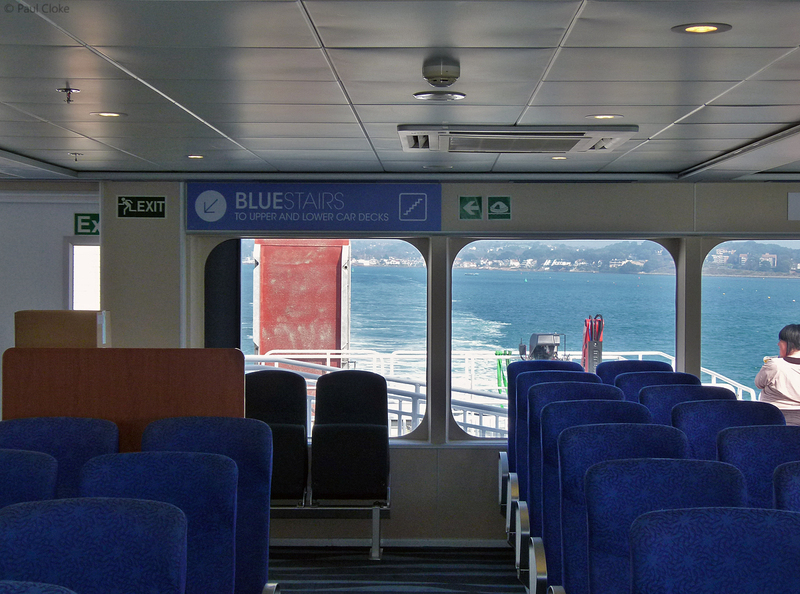 The builders claim that the vessels design optimises performance, seakeeping, fuel efficiency and passenger comfort. The vessel utilises Austal’s trimaran technology which combines the softer roll of monohulls with the low resistance, stability and carrying capacity of a catamaran. A lower roll speed means lower accelerations experienced by the passengers which should significantly reduce passenger seasickness. 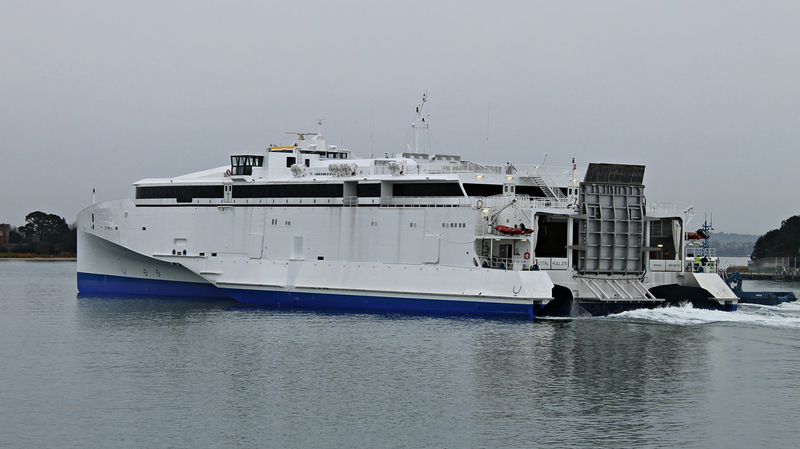 She was acquired by Condor Ferries in August 2014 and following four months and $6 million worth of modifications (this included the fitting of bridge wings to aid berthing in Guernsey and Jersey) at Austal’s shipyard in Balamban, Cebu in the Philippines she embarked on her delivery voyage to the UK on the 4th December 2014. The 10,500 nautical mile voyage lasted 22 days and saw the ship sail across the Indian Ocean, through the Suez Canal and via the Mediterranean before travelling up the Bay of Biscay and into the English Channel where she arrived on the 26th December 2014. 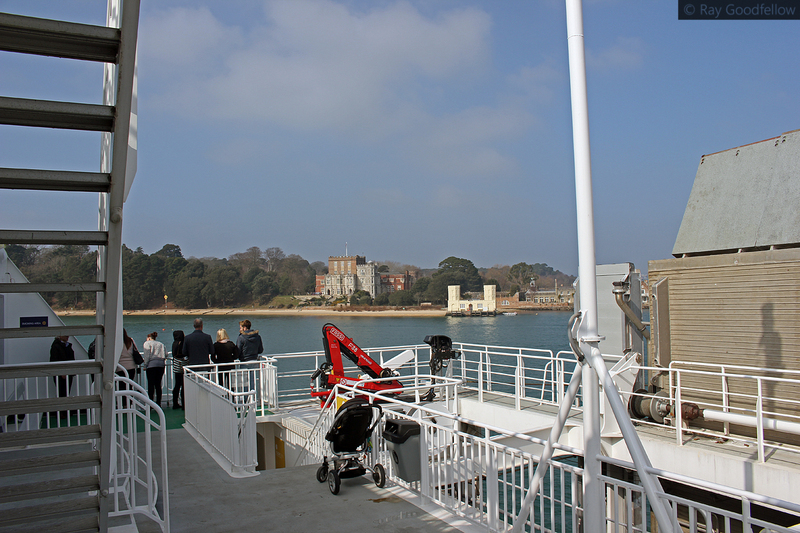 Following her arrival in the UK the vessel underwent an extensive two month refit alongside in Poole. 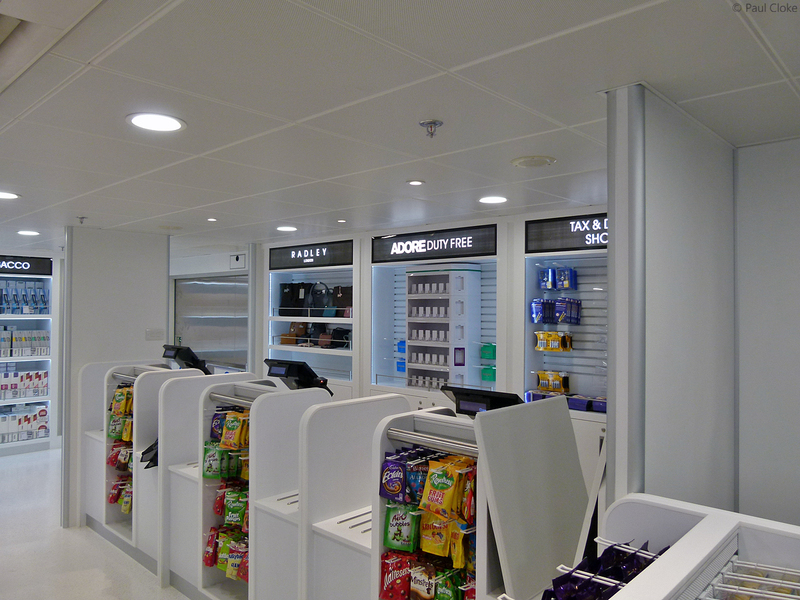 The refit was completed by the Southampton based marine outfitting company Trimline. 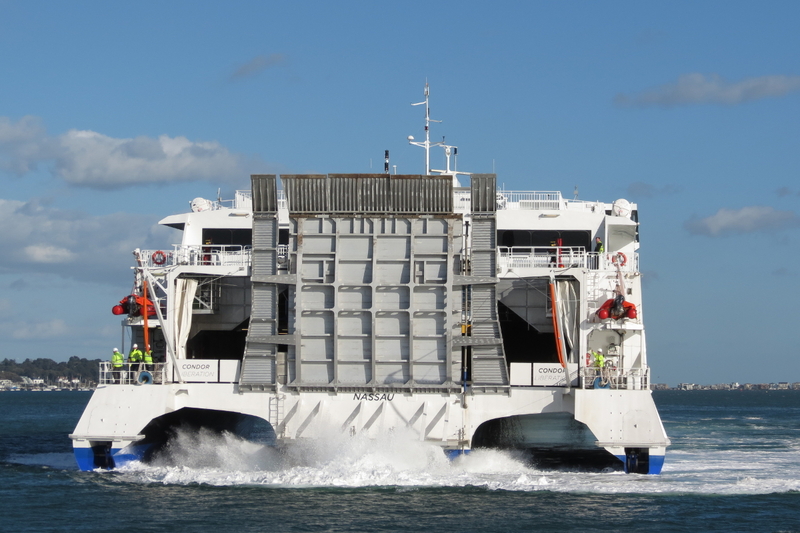 Trimline were supported in the outfitting process by the Dover based marine engineering company Burgess Marine and a team of engineers from the vessels builders, Austal Ships. When the ship arrived in the UK she was a basic shell and needed to be customised to the requirements of Condor Ferries. 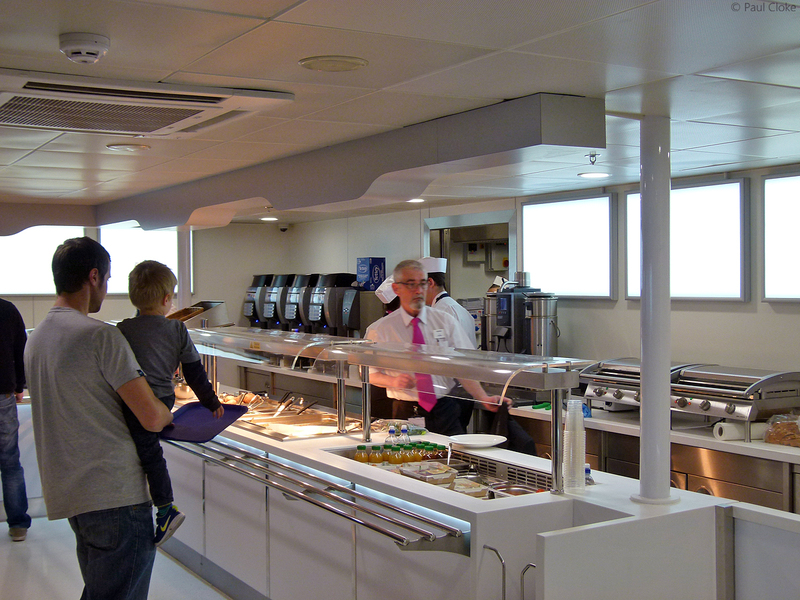 The vessel did not have a galley, Trimline designed and installed a bespoke galley on the ship to serve the Casquets Bistro and the Ocean Club lounge. Both of these areas were also designed and created by the Trimline team. 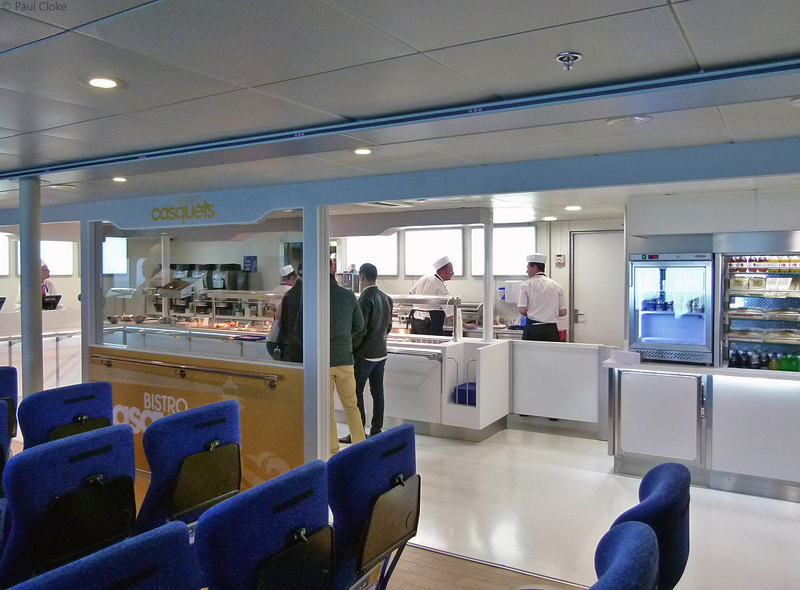 Lighting, seating, catering equipment and serveries were all designed and installed to complement the new Condor Ferries colour scheme. 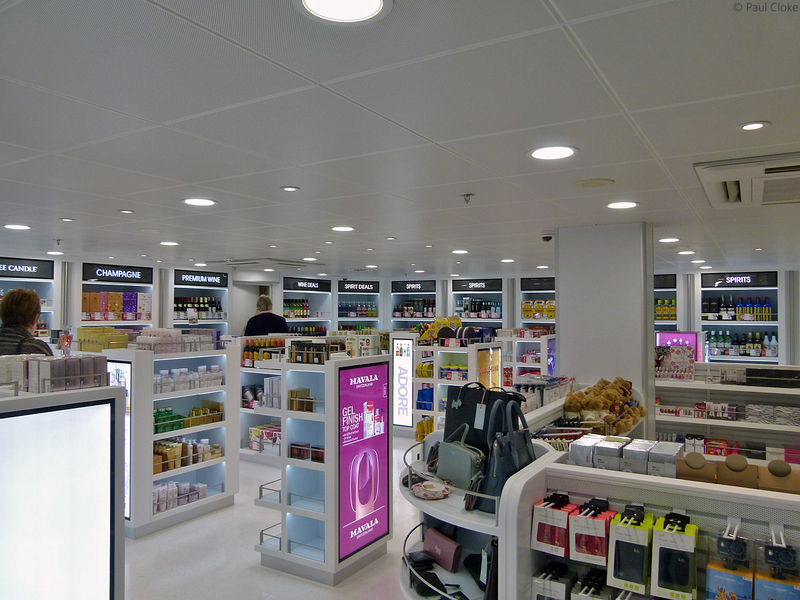 The Bar, Bureau de Change, Children’s Area and Duty Free Shop also underwent a major transformation. 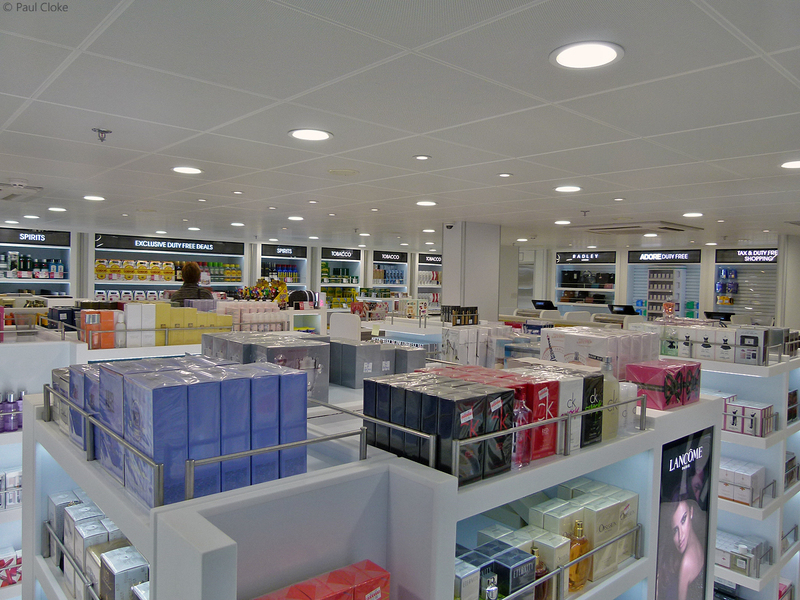 All the display units for the shop were created at Trimline’s Southampton headquarters. Electrical work and flooring were also undertaken by Trimline to complete the refurbishment. 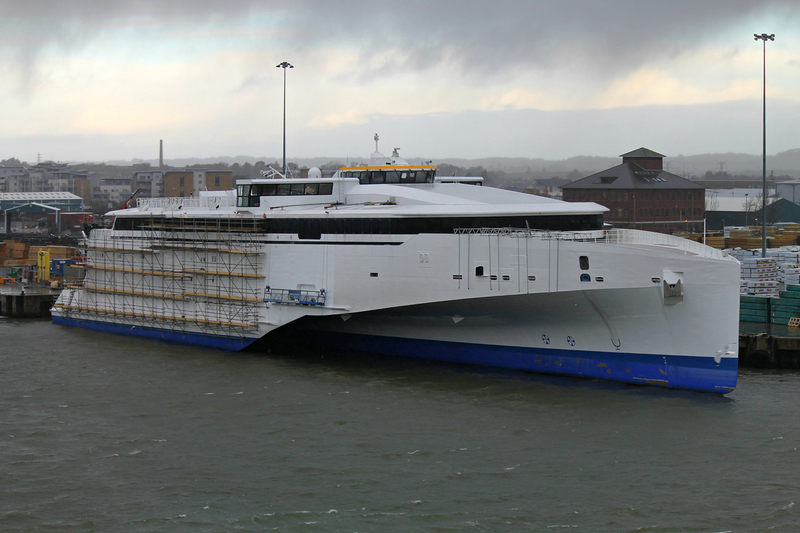 Being a high-speed ferry the Condor Liberation required specialist materials which saw Trimline manufacture units from specialist lightweight materials to enable the vessel to stay within safe weight limits for operation. Chris Gosling from Shipping TV had the opportunity of looking around the ship during her refit in Poole where he got to see and document the work undertaken by Trimline. He also got to speak to Andy Richards, CEO of Trimline about the scope of the project. 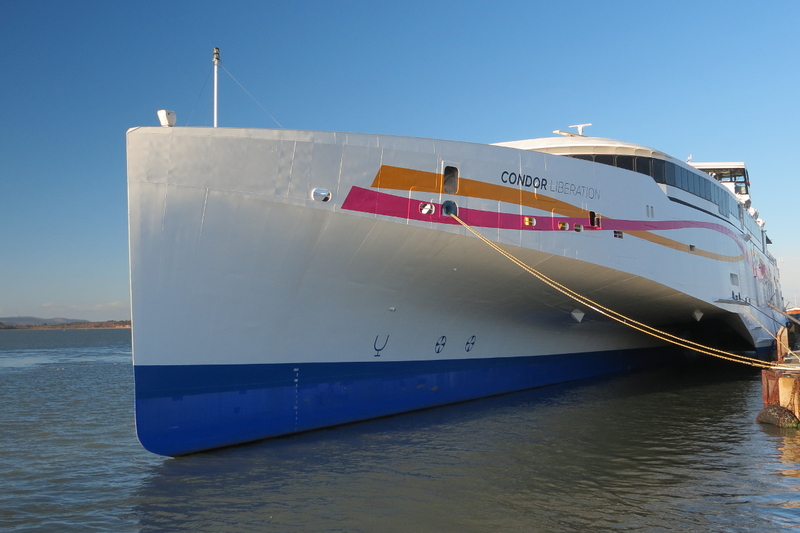 As well as the refit Condor Ferries needed to find a name for their new vessel. 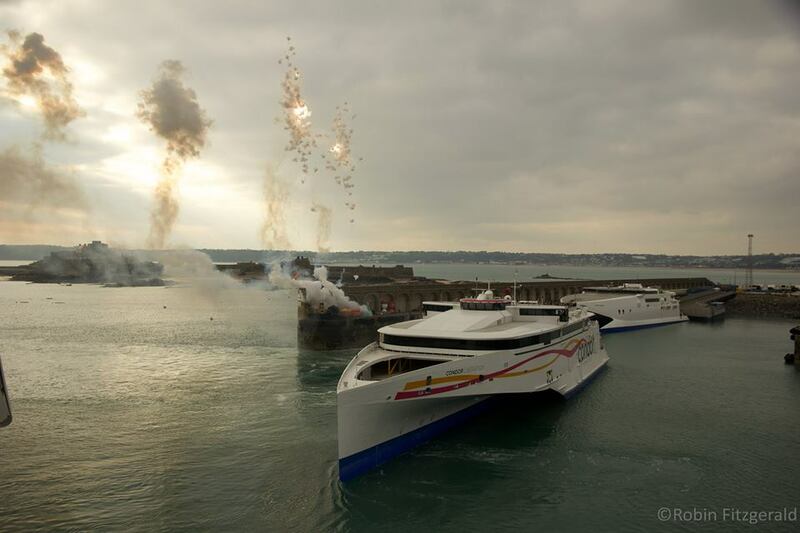 In December 2014 the company launched a competition for the public of the Channel Islands to name their new vessel. 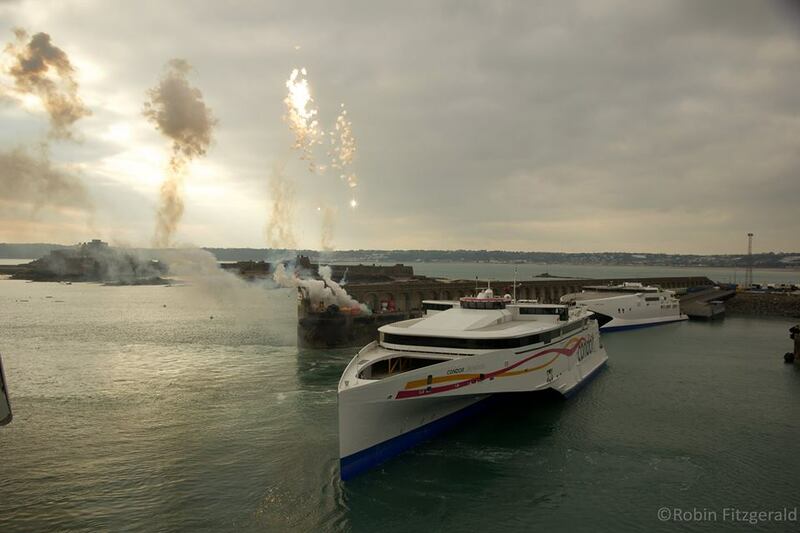 Over 7,000 entries were received and on the 27th January 2015 the company announced that Clive Davies from Guernsey was the winner with the name Condor Liberation. 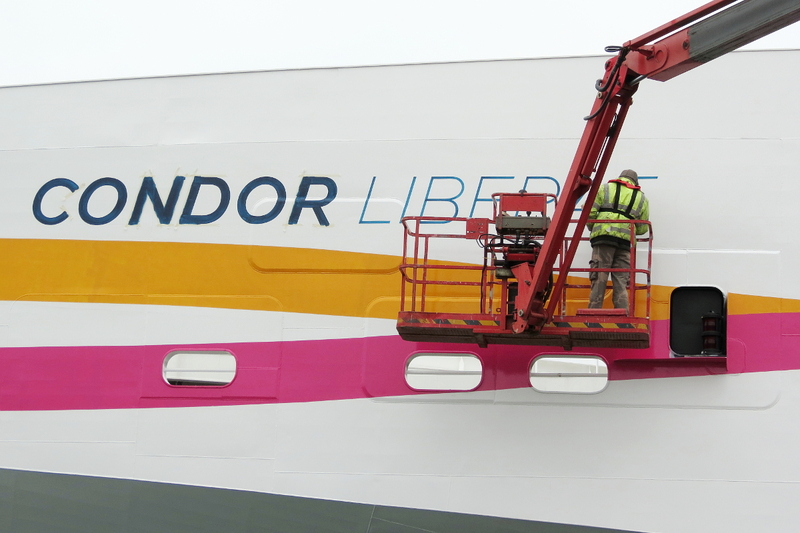 With the new name came a new livery and a new corporate identity for Condor Ferries. Gone were the red and white stripes to be replaced by three new colours – dark blue, pink and gold. 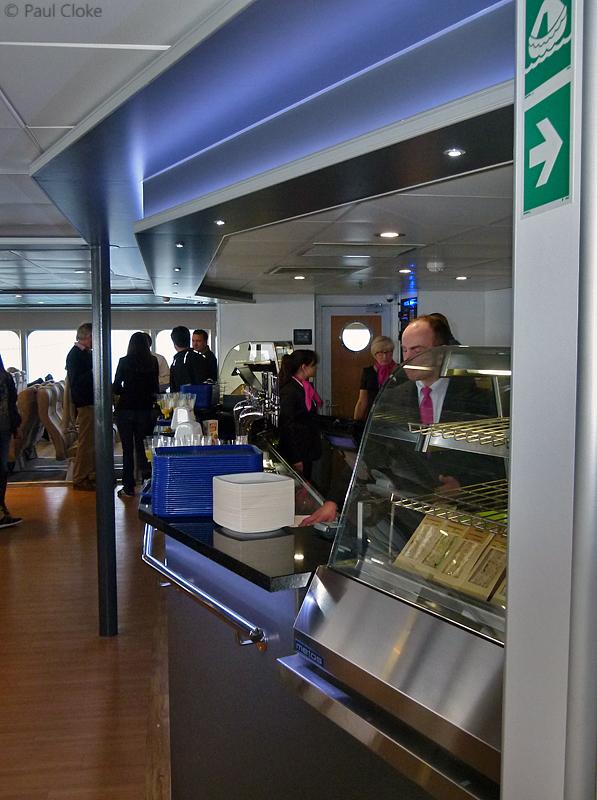 The distinctive ribbons, which were a feature in the previous ship’s livery have now evolved and have been used on the ships hull as well as on the new branding throughout the rest of the company, including the new company logo. 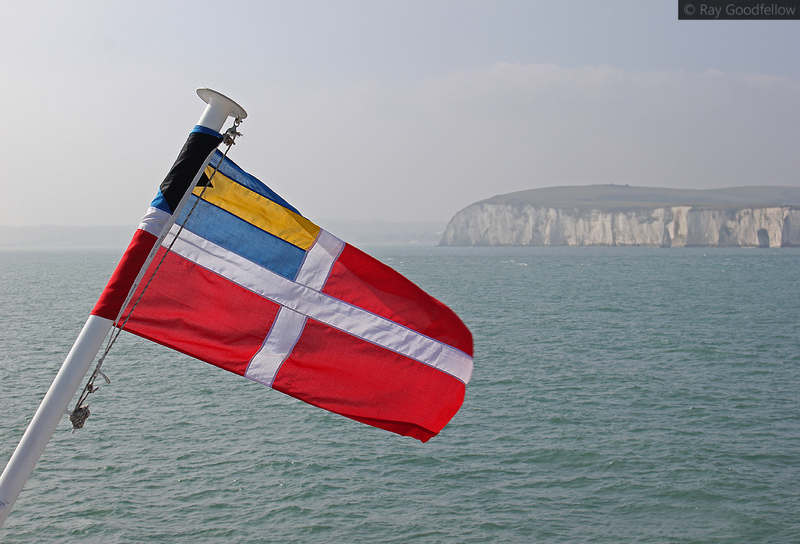 The Condor Liberation departed Poole on the 10th March 2015 for her first set of sea trials in the English Channel. This was the first time she had departed the port since her arrival on the 26th December 2014 from the Philippines. 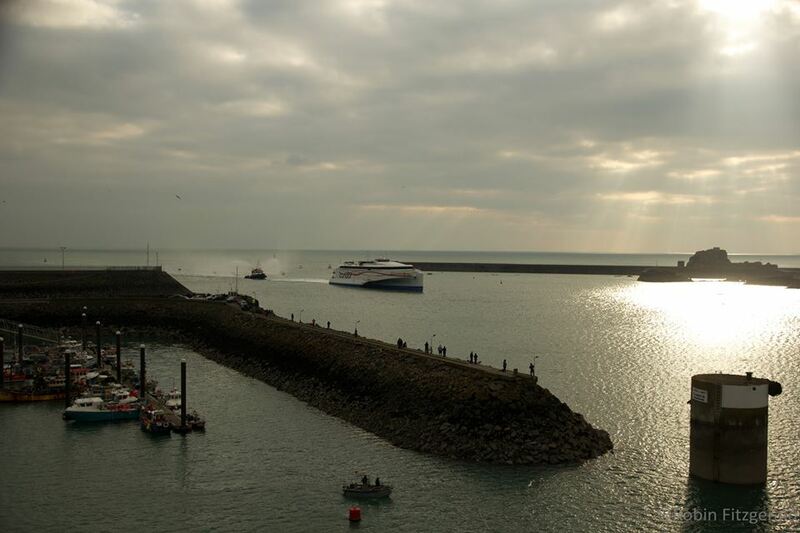 The purpose of the trials were to test the new navigation and control systems and to put the ferry through its paces ahead of the first scheduled sailing on the 27th March 2015. 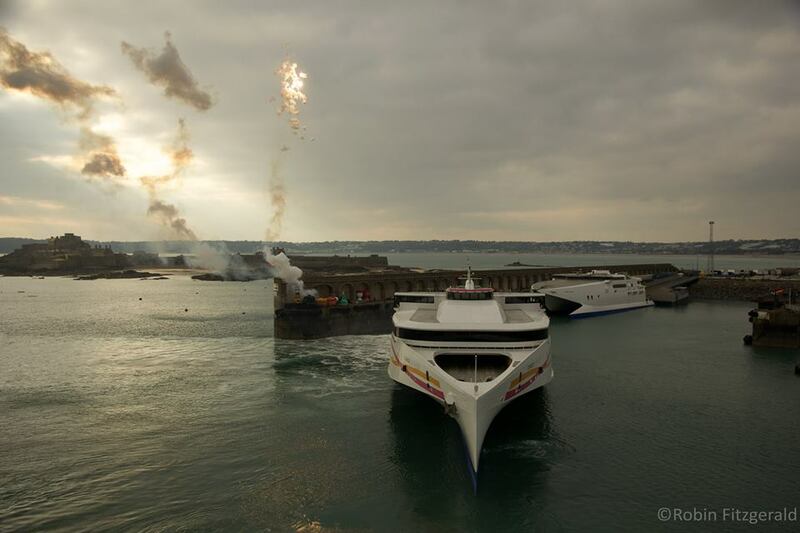 Trials were repeated again on the 11th March and then the ship visited St Peter Port, Guernsey on the 16th March and then St Helier, Jersey on the 17th March to conduct berthing/ramp trials before returning to Poole to complete crew familiarisation. 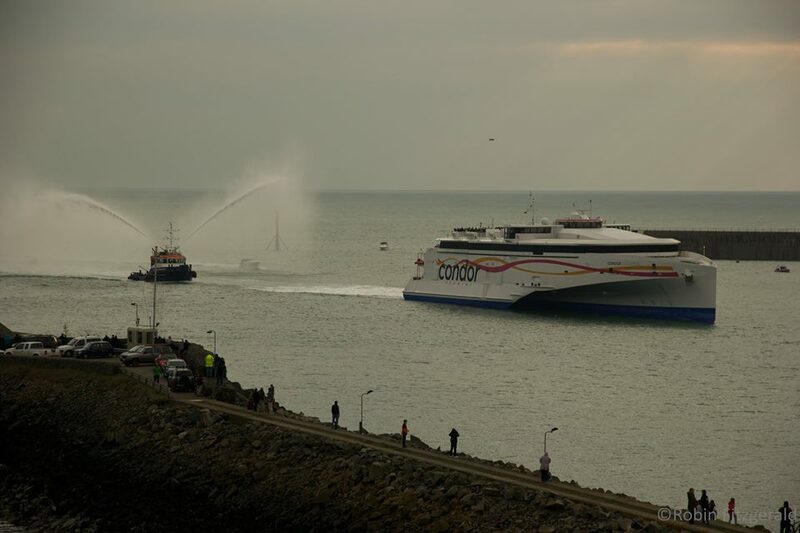 On Thursday 19th March 2015 Condor Ferries conducted a shakedown cruise of the Condor Liberation from Poole. The aim of the shakedown was to test the loading procedures and the facilities onboard the ship in a ‘in service’ condition. 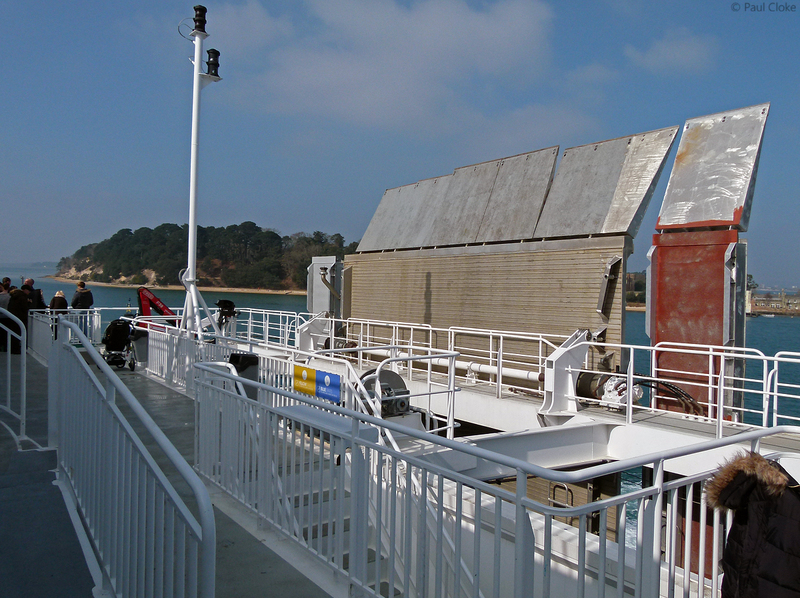 Car drivers were disembarked and then re-embarked to test different loading configurations on the car deck and then the ship departed Poole at 11:15 for engine trials in the Channel. The ship was back on the berth for 13:15. 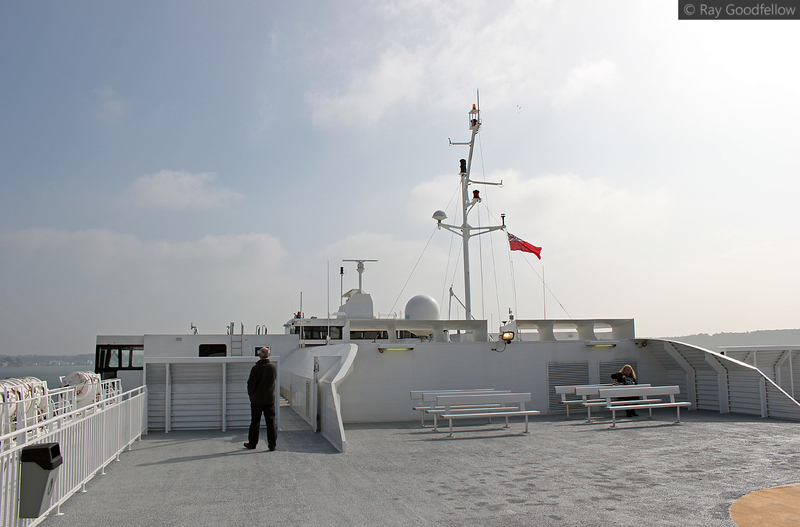 Following the shakedown cruise the ship then visited Guernsey on the 20th March and Jersey on the 21st March where Open Days were conducted to allow the local residents of the Channel Islands to have a look around the new ship. 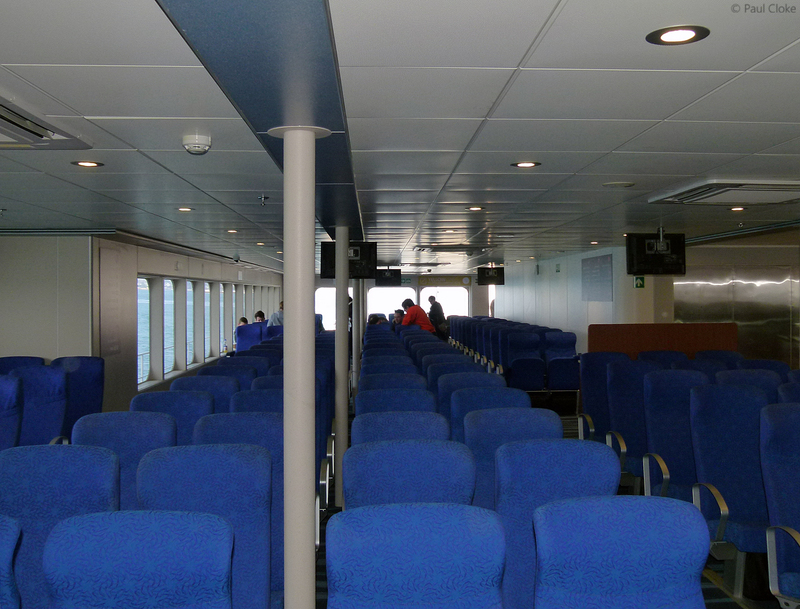 The Condor Liberation has one deck of passenger facilities compared to the two decks found on the previous fast ferries Condor Express and Condor Vitesse which previously served on this route. 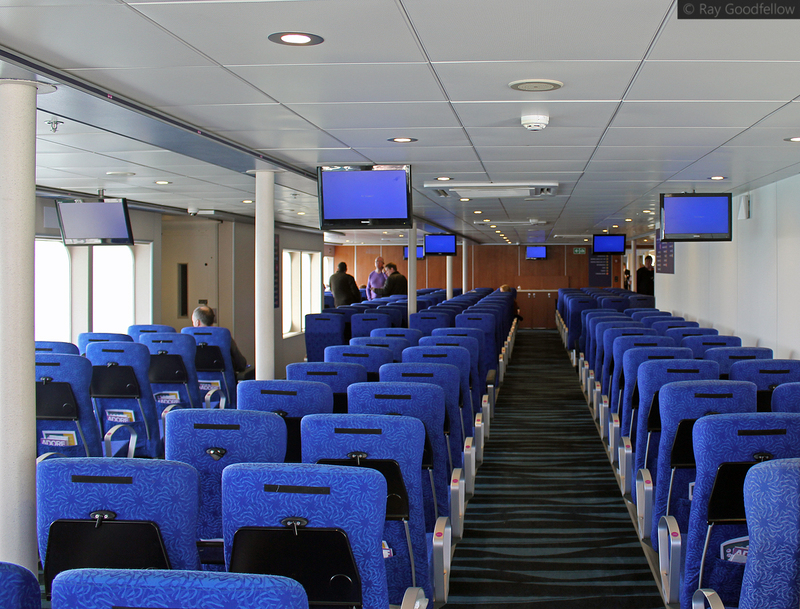 The ship offers three grades of seating, these are Ocean Traveller, Ocean Plus and Ocean Club. Ocean Plus is situated at the bow of the vessel in the Horizon Lounge, Ocean Club is situated on the starboard side of the vessel behind the Ocean Plus Lounge. 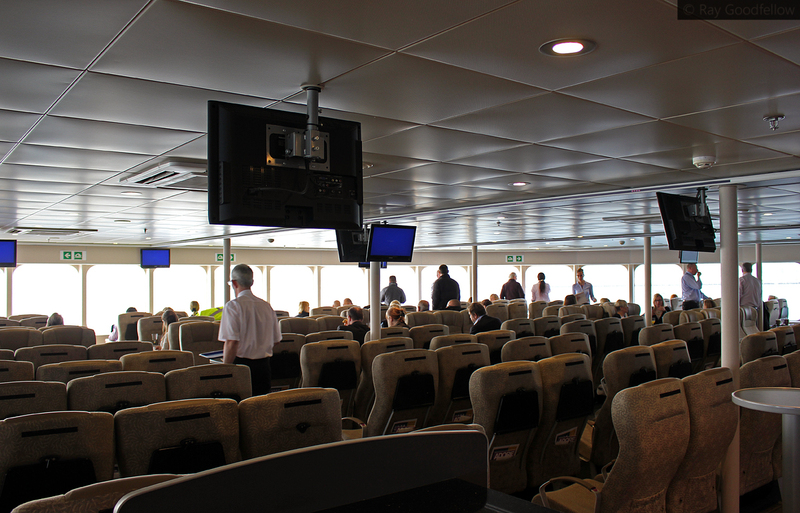 All other seating available on the vessel is designated as Ocean Traveller. 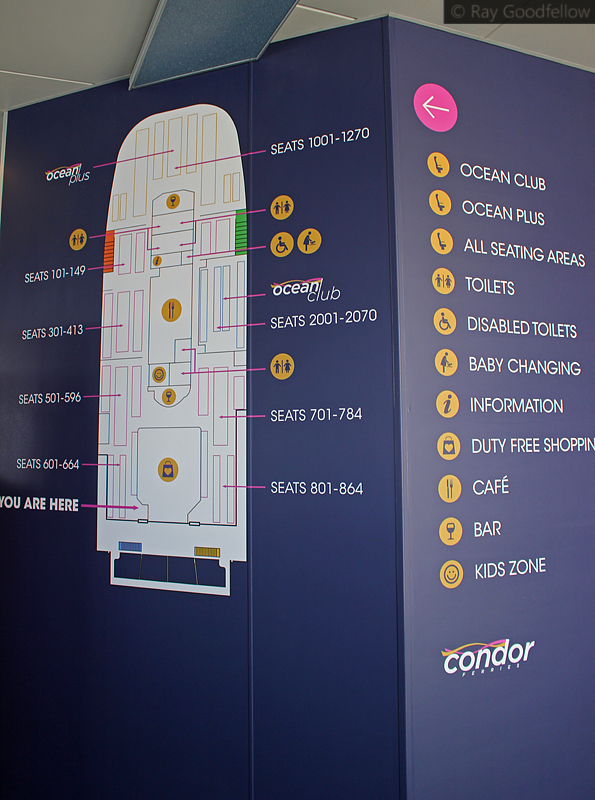 All lounges feature overhead television screens to display the all important safety information and sales messages. 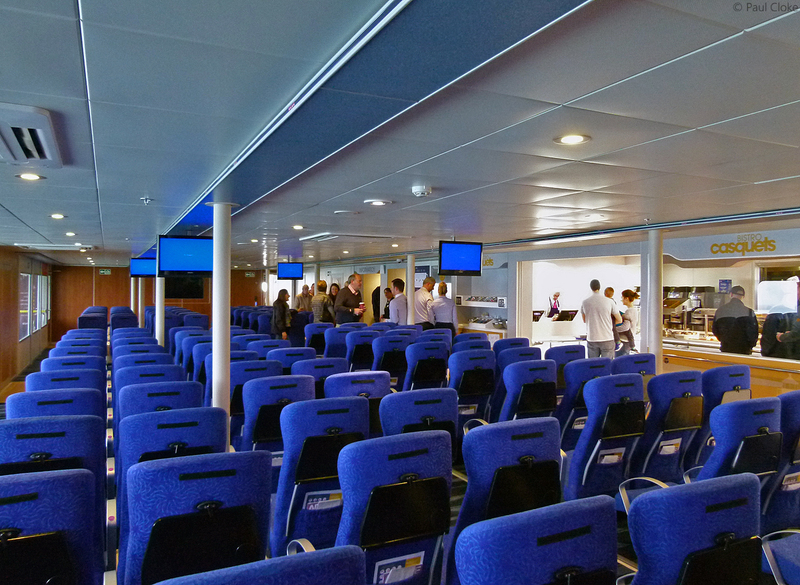 The vessel has a self-service restaurant (Bistro Casquets), a large Duty Free shop (Adore Duty Free), two bars, one of these dedicated to Ocean Plus customers in the Horizon Lounge, a children’s play area, Bureau de Change and two outside deck areas. 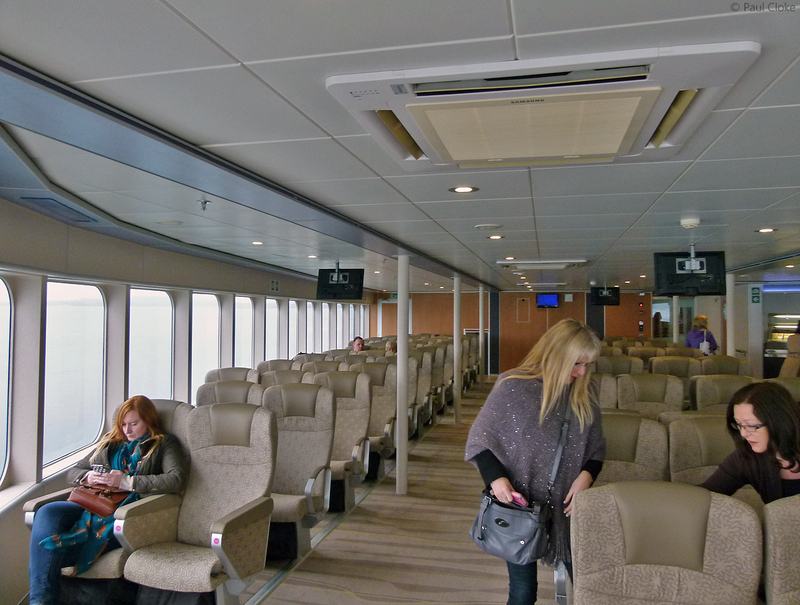 Throughout the ship is light thanks to the use of large windows and is fairly spacious. 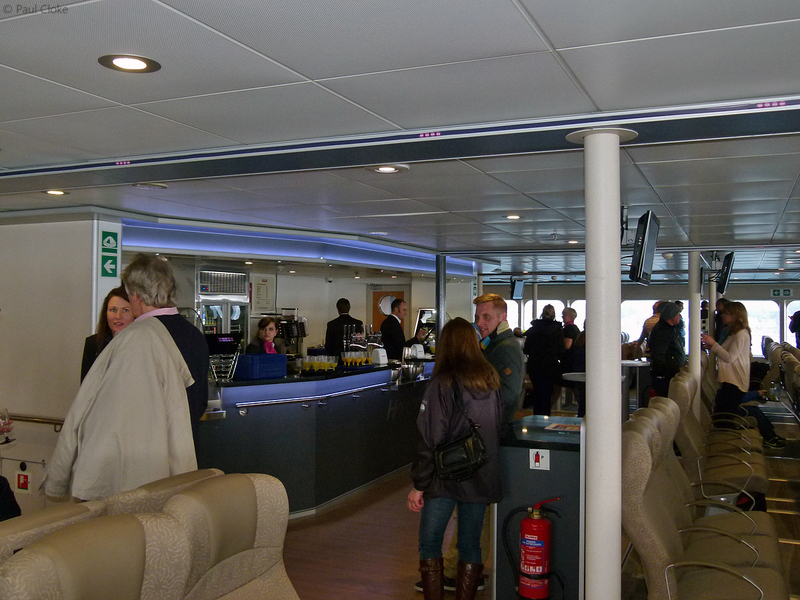 The internal fit out of the vessel has been completed by Trimline to a very high standard. 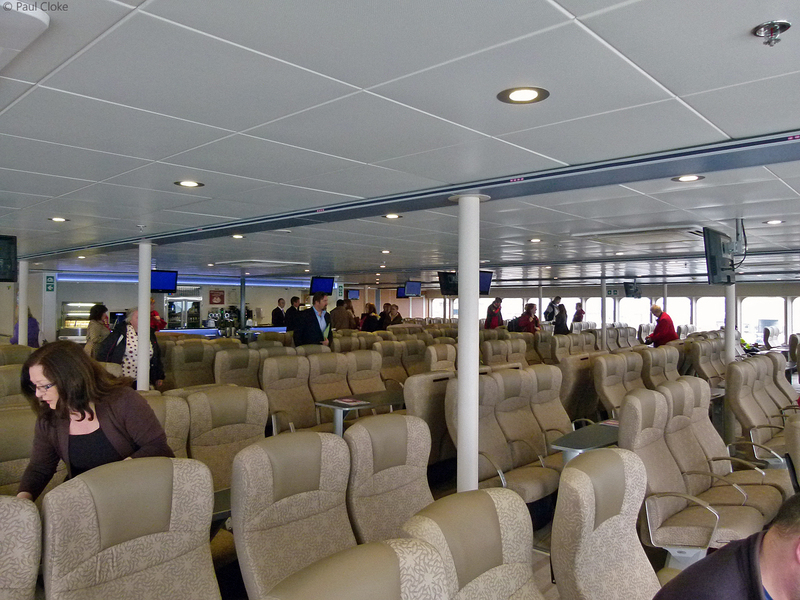 Ocean Plus seating is situated at the bow of the vessel in the Horizon lounge. This lounge offers panoramic views forward. The seats are either situated around tables, or are reclining with a tray table. 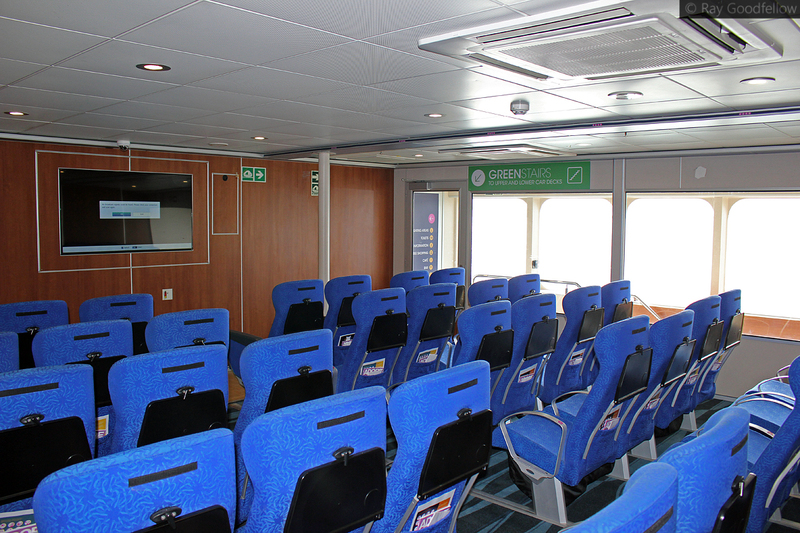 All Ocean Plus seats have access to a power supply for charging phones, laptops, tablets etc. 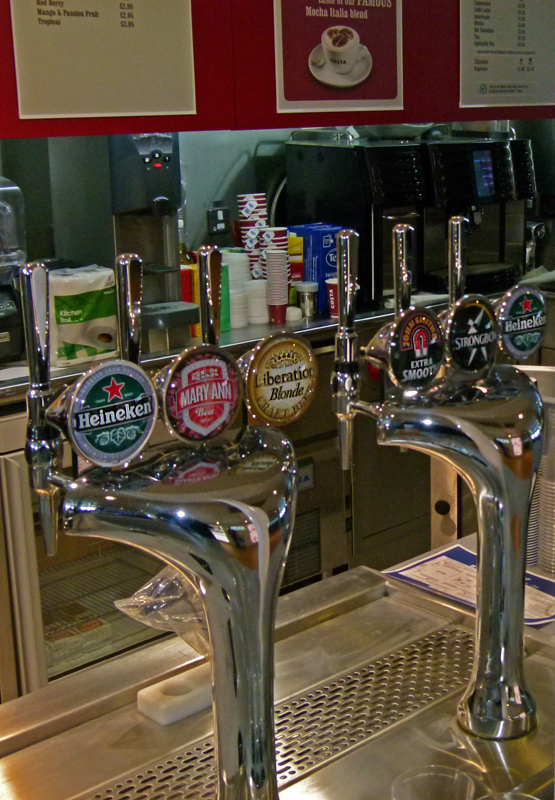 Access to this lounge is via key card entry and it has its own exclusive bar/servery situated at the rear of the lounge. 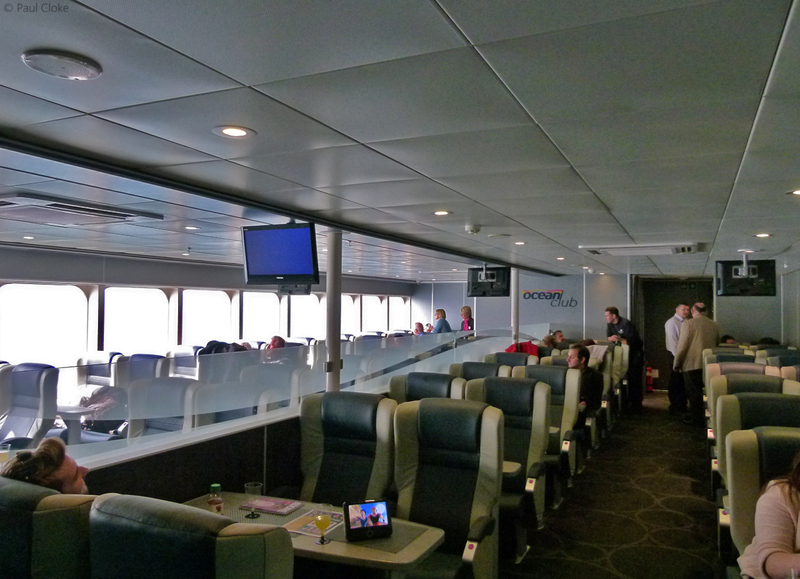 Ocean Club is the premium lounge available onboard the Condor Liberation. The lounge features leather reclining seats and tables. 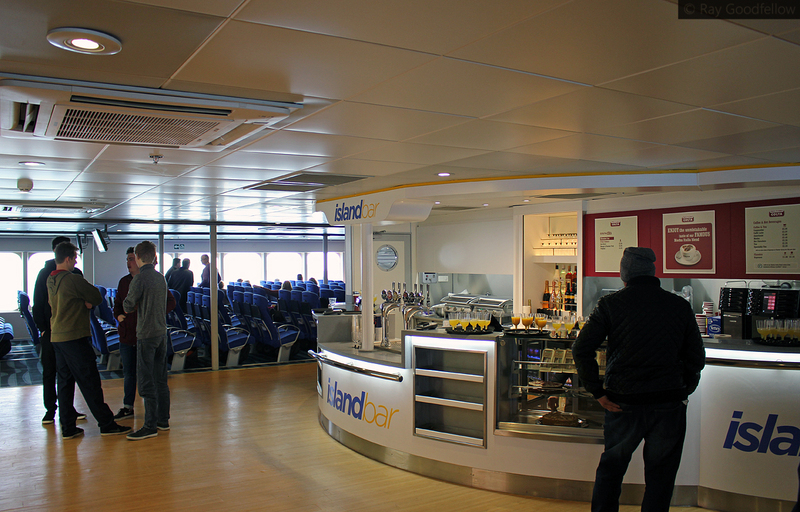 This lounge has a steward service along with a selection of refreshments. 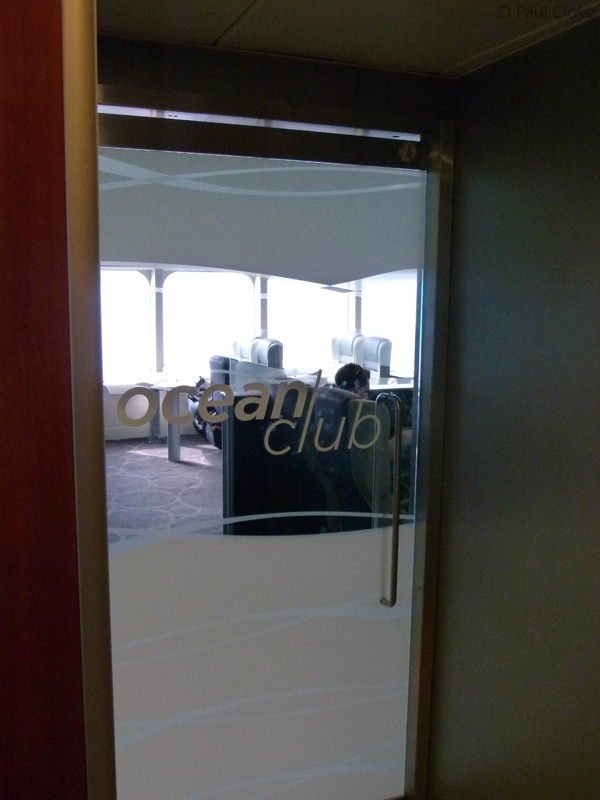 The Ocean Club Lounge has its own exclusive (payable) menu which is served at your seat. All seats feature ‘at seat’ power supply and wi-fi is available. 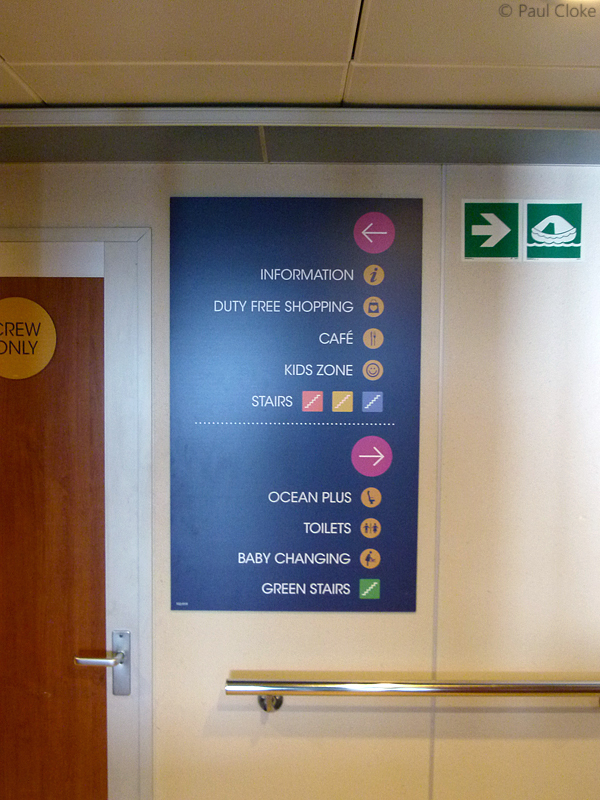 I can see this area of the ship being popular for business people who wish to work during their crossing. 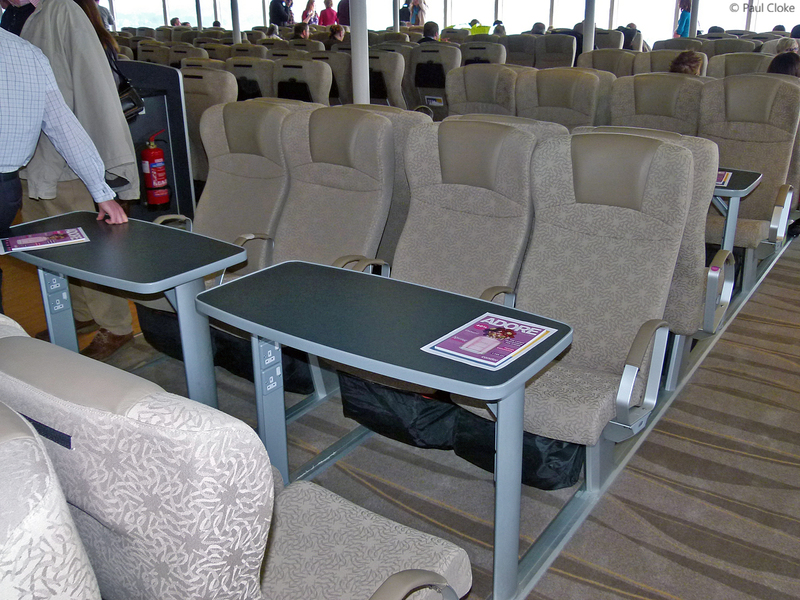 Ocean Traveller seats are situated around the vessel and are all airline style with folding lap trays. 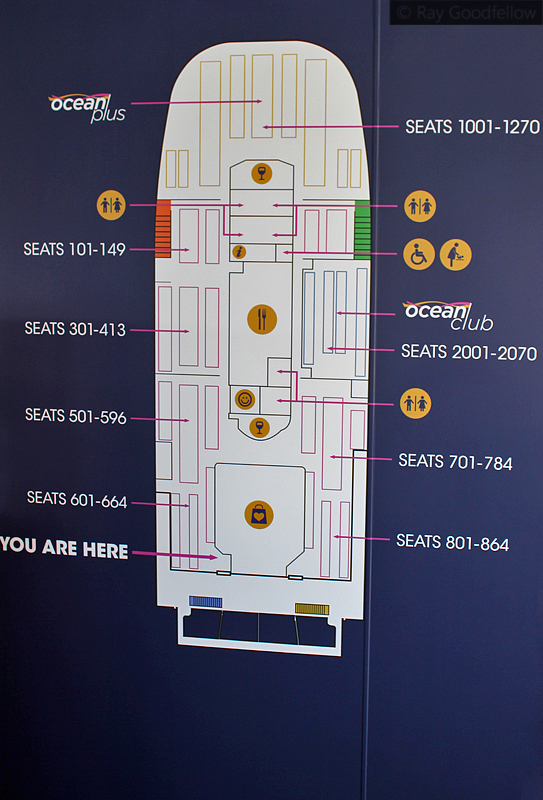 Ocean Traveller seats are all pre-assigned, so your allocated a specific seat. 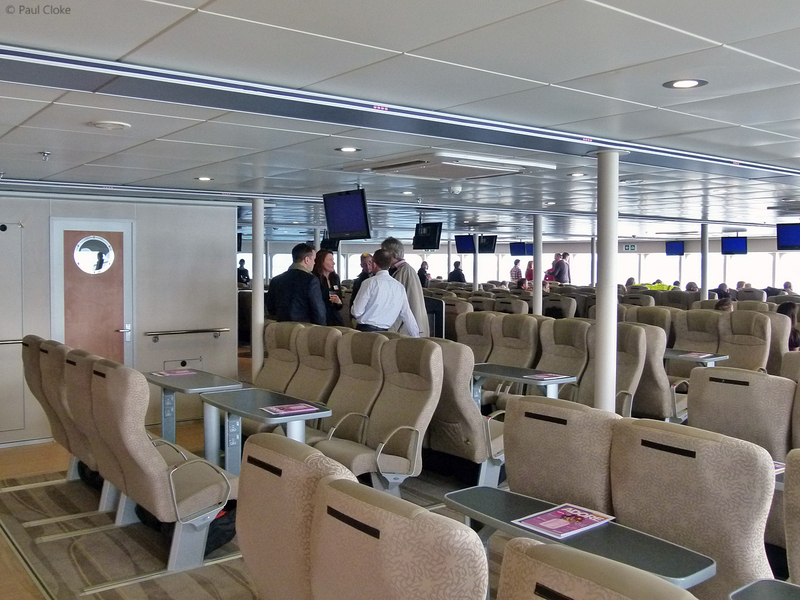 These open seating areas offer good access to Casquets Bistro, The Island Bar, Adore Duty Free Shopping and the outside deck space situated at the stern of the vessel. 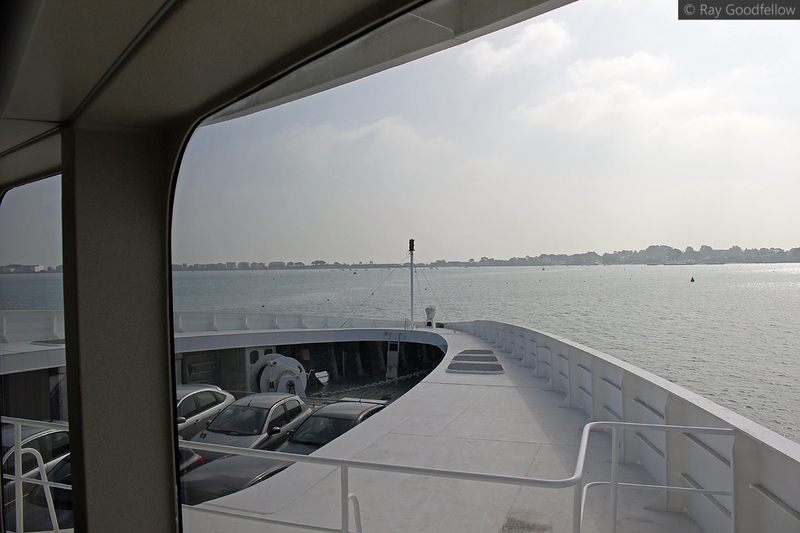 Situated amidships opposite the Ocean Traveller seating the Casquets Bistro has a large serving area and offers a varied menu selection, from full Traditional Hot English Breakfast to traditional main meals such as fish and chips. 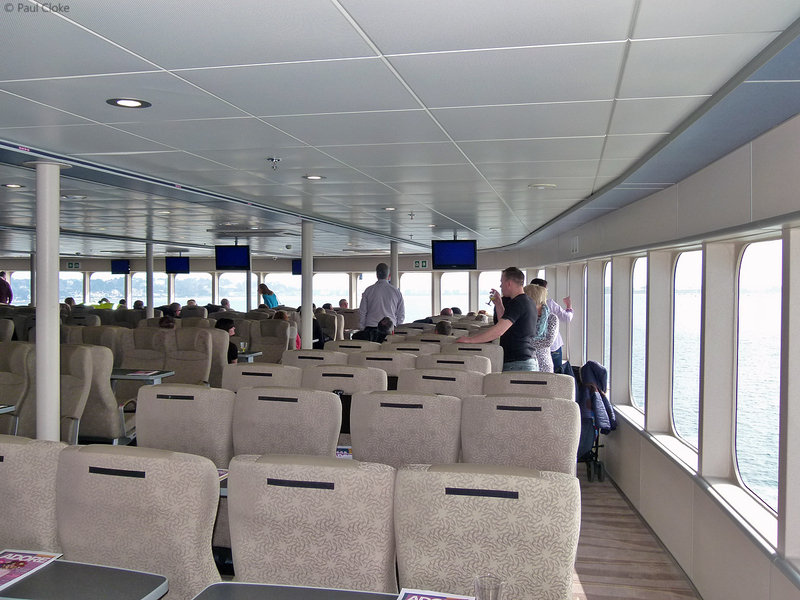 This area is fairly open plan and there is a large area of Ocean Traveller seating opposite on the port side. 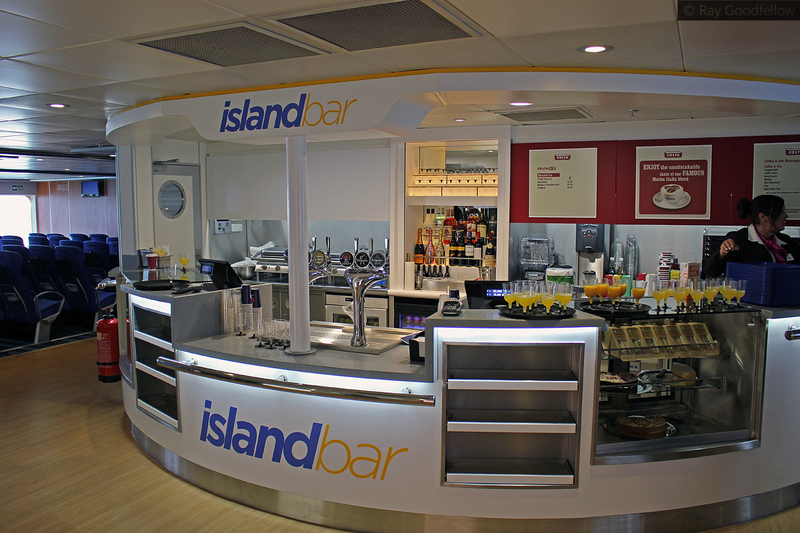 Situated astern of the Casquets Bistro and opposite the Adore Duty Free Shop is the Island Bar. 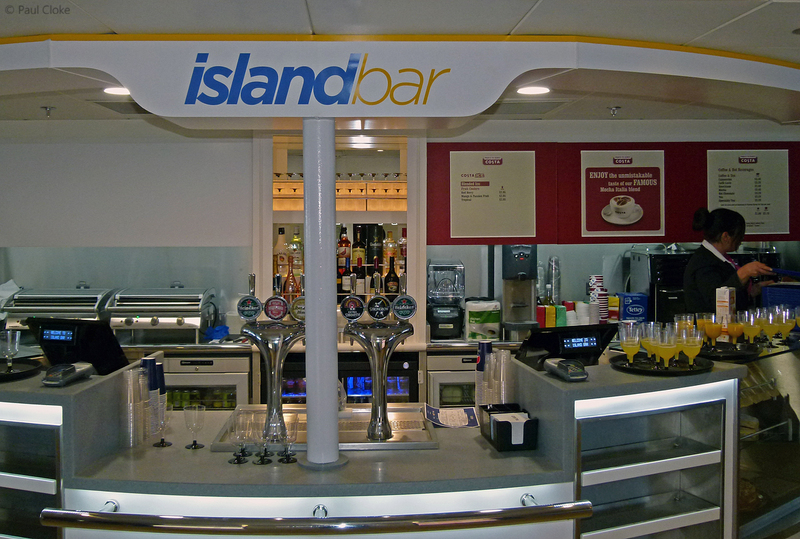 The bar offers a range of alcoholic beverages, including draught beers from the Channel Islands, one ironically called ‘Liberation Blonde’, snacks, Costa Coffee, sandwiches and cakes. 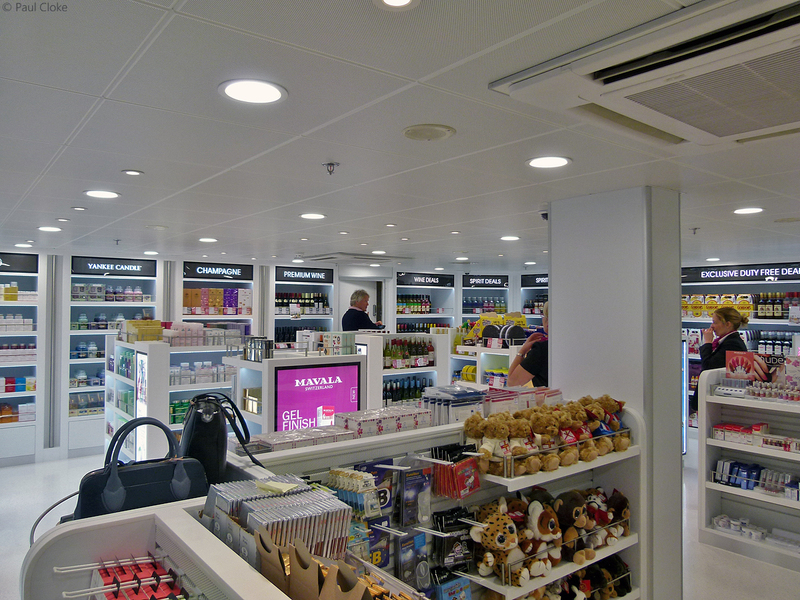 As the Channel Islands are outside of the European Union Condor Ferries are able to offer Duty Free goods to its passengers. 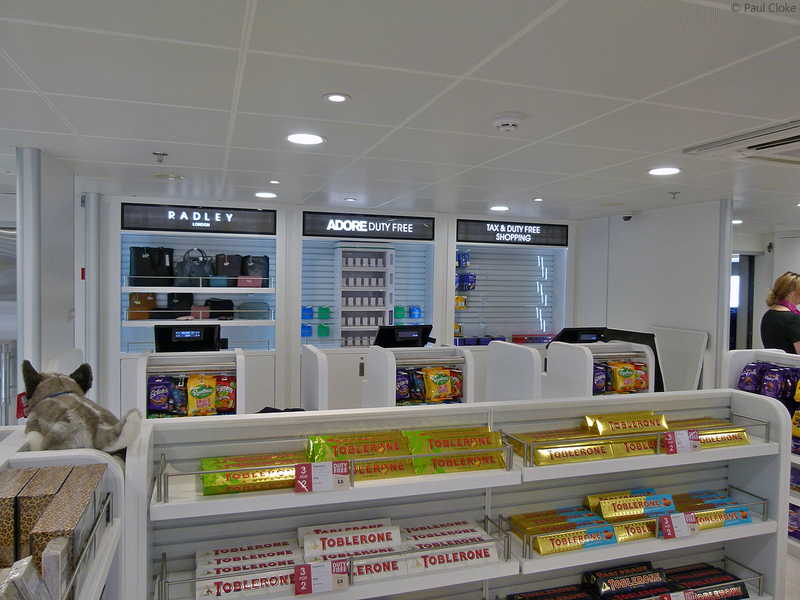 Situated at the stern of the vessel the Adore Duty Free shop is large by fast ferry standards and offers a large range of goods from alcohol and perfumes to confectionary and gifts. Fitted out in white the area is very spacious and bright. 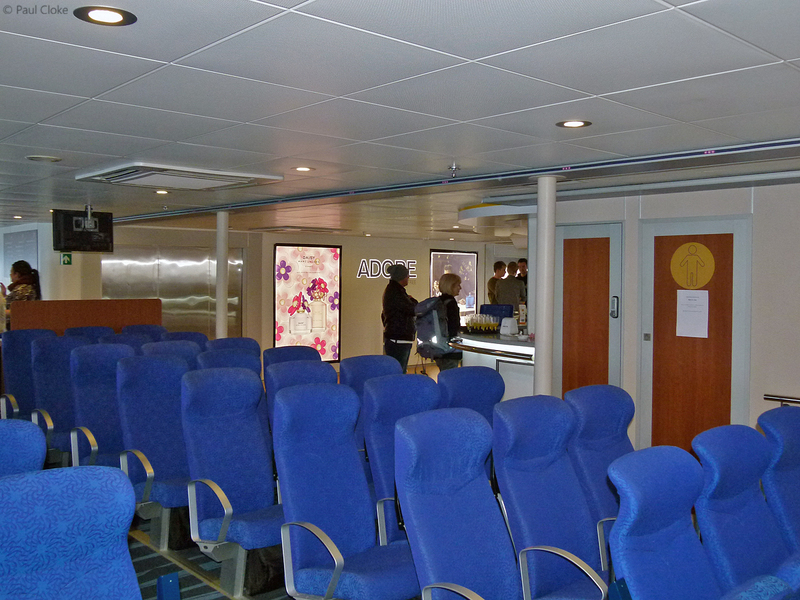 The Condor Liberation features two outside deck areas. 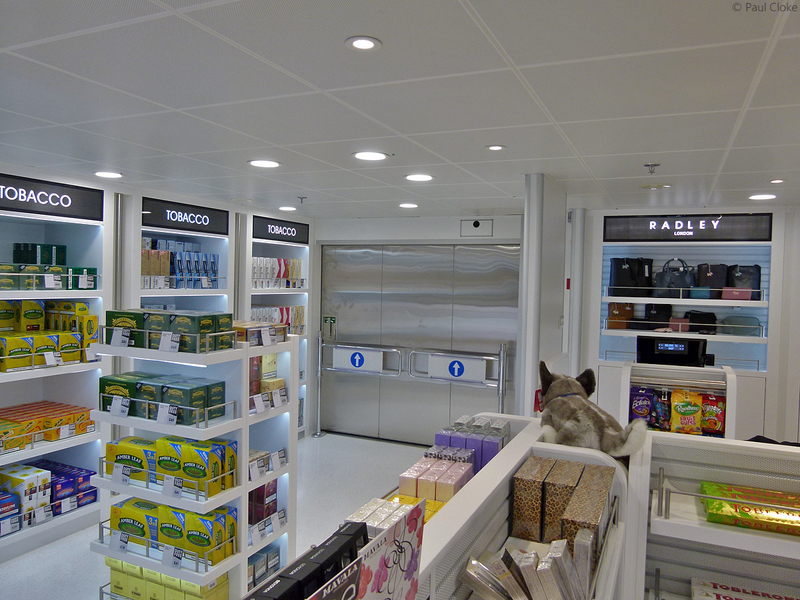 There is the lower area situated to the rear of the passenger accommodation which is accessed via two sliding doors (Port and Starboard) to the rear of the Duty Free Shop. 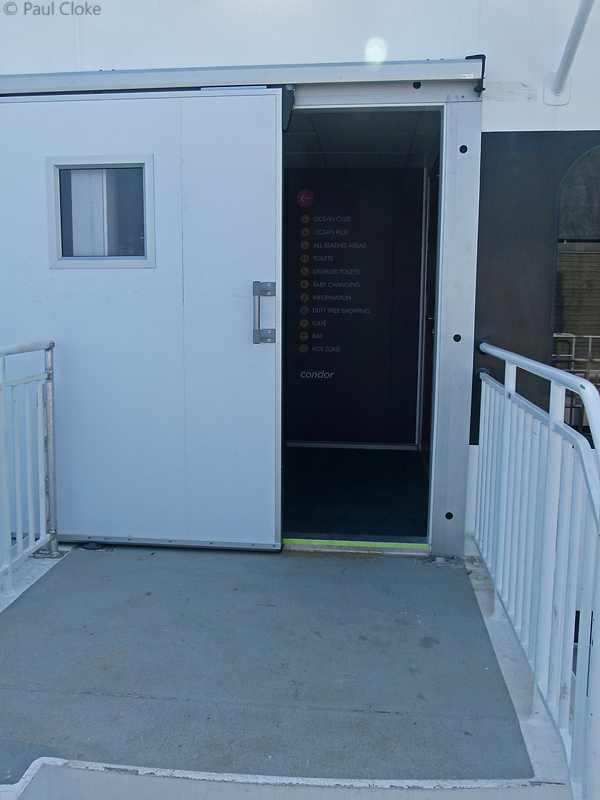 A ramp is available for wheelchair and pram access. 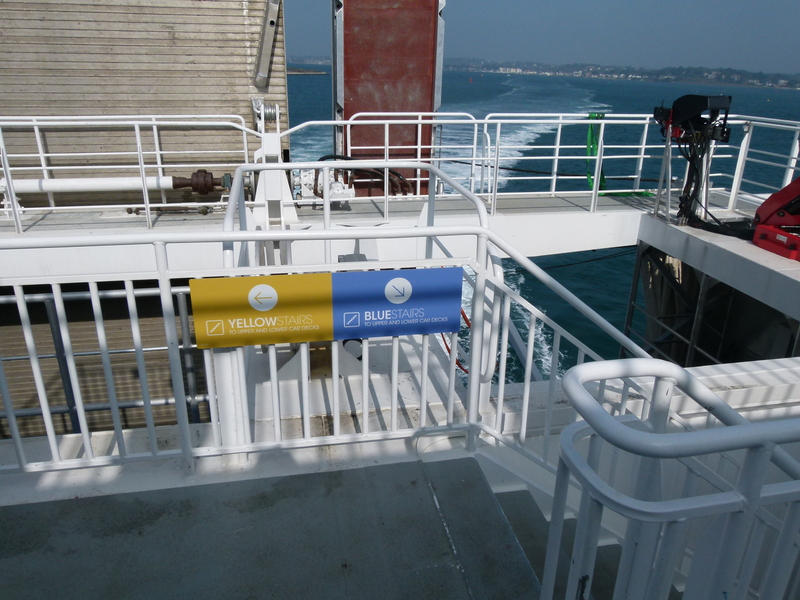 The Blue and Yellow stairs to the car deck are also accessed from this area of the vessel. 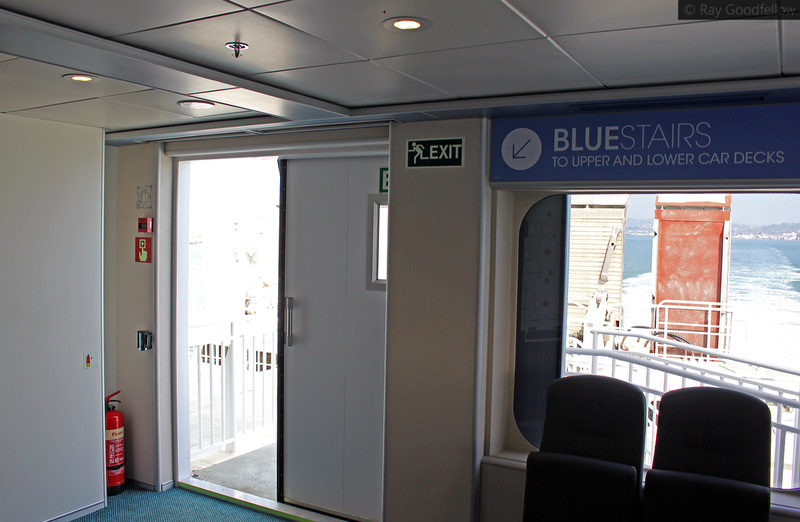 A smoking area is situated on the starboard side of the vessel. 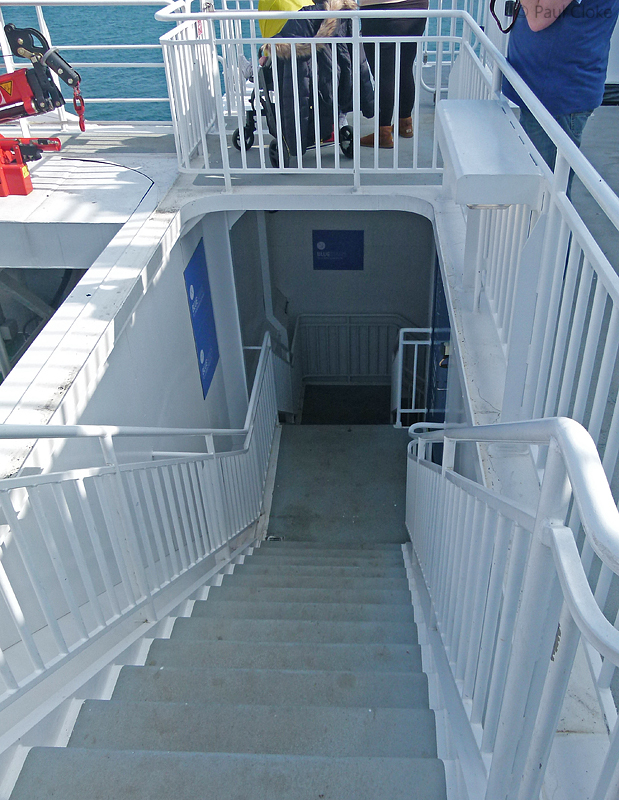 An external staircase leads from here to the upper outside deck area. 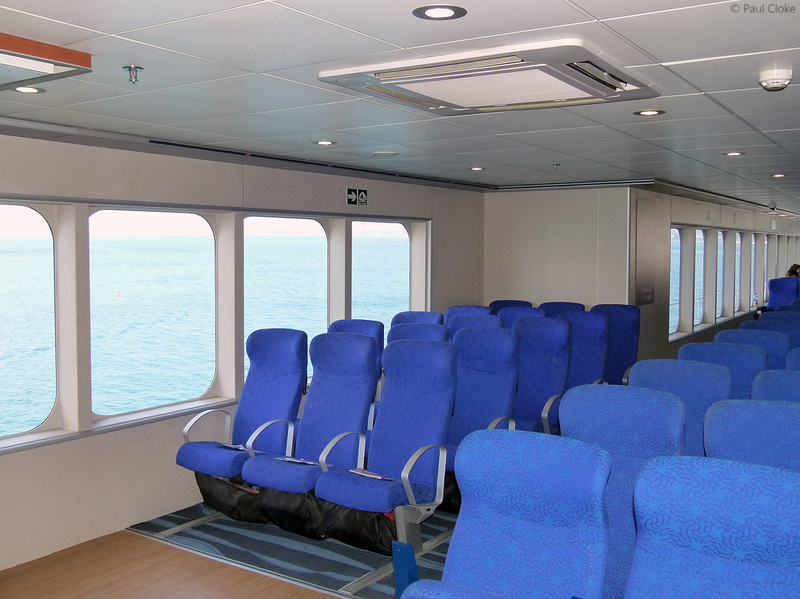 Situated above the main passenger accommodation is the upper outside deck area. 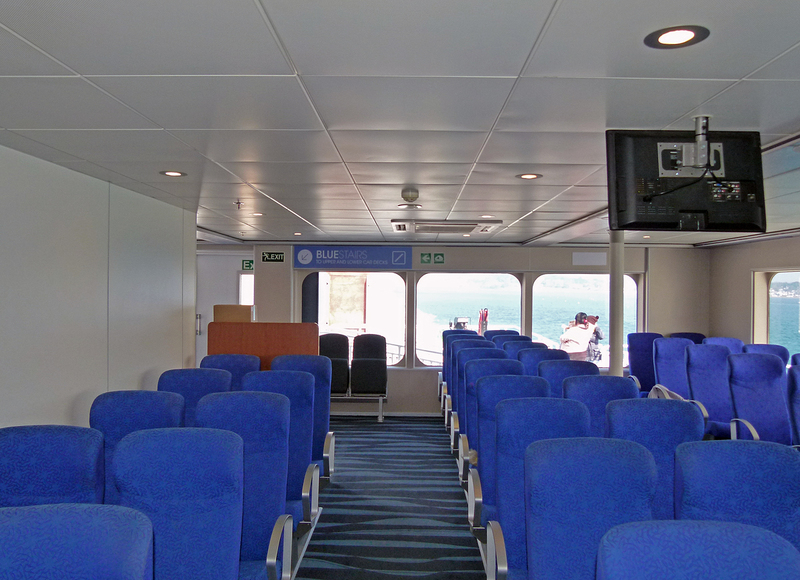 This large area gives excellent views both port and starboard and has an area of seating situated behind the wheelhouse. 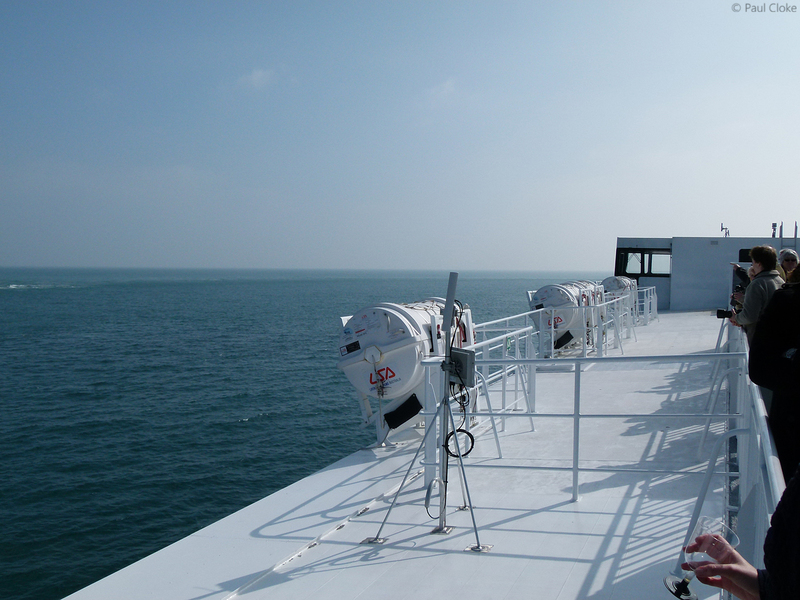 This area has protection from the wind and is quite comfortable even when the vessel is travelling at full speed. 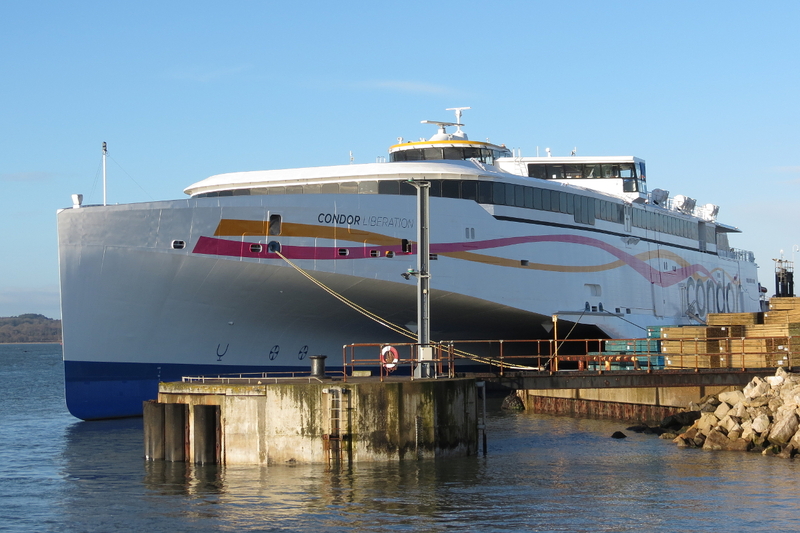 Three months after arriving at the Port of Poole for fitting out, the Condor Liberation finally sailed on its first commercial voyage from Poole to the Channel Islands on 27th March 2015. 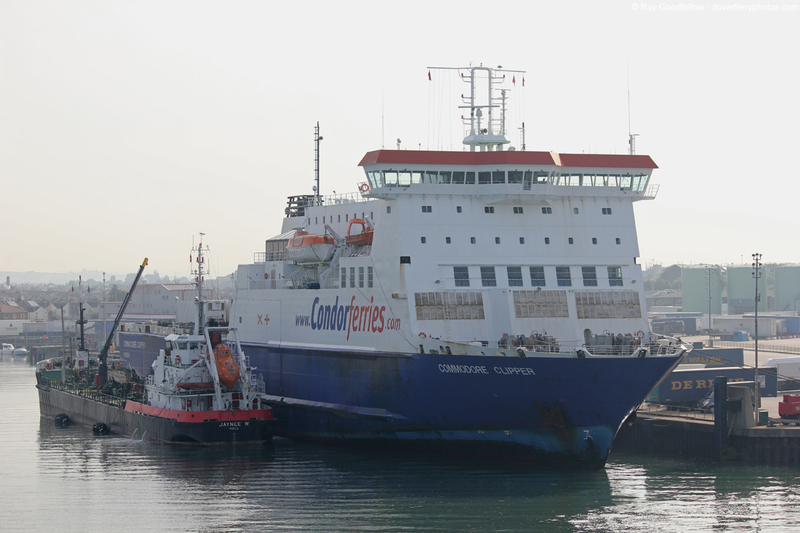 I understand that a lot has been said and written about the Condor Liberation during the past week after an unfortunate incident which resulted in the vessel receiving hull damage whilst berthing during strong winds in Guernsey on her second day in commercial service. This incident resulted in the cancellation of all of her sailings until Easter Sunday. However we would like to point out that this article is based on the events leading up to the entry into service of the Condor Liberation and the vessel we experienced during the shakedown cruise on the 19th March 2015 and not what happened to her following her entry into service. All items included in this article are subject to © copyright. Please see individual images/videos for copyright information. We would like to take this opportunity of thanking: Condor Ferries, Austal Ships, Paul Cloke, Kevin Mitchell (Maritime Images), Dan Hall, Chris Gosling (Shippingtv) and Robin Fitzgerald (Jersey Coastguard) for their assistance in producing this feature.